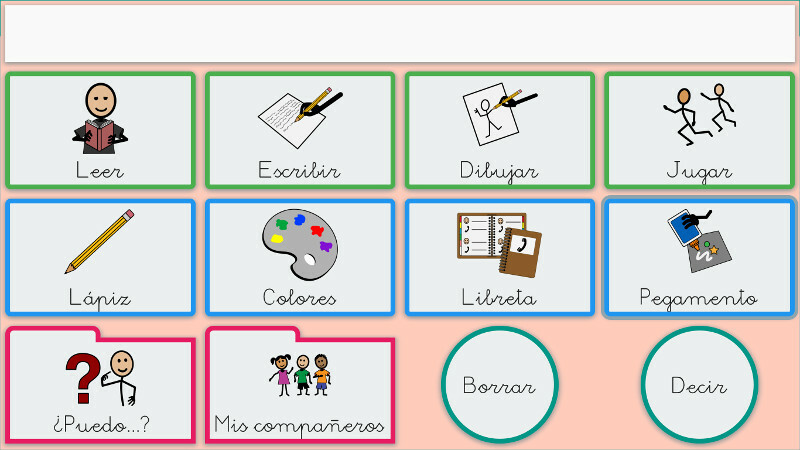 Use the text box to find communication boards and educational activities with the selected filters, or click on the links below to browse the categories. 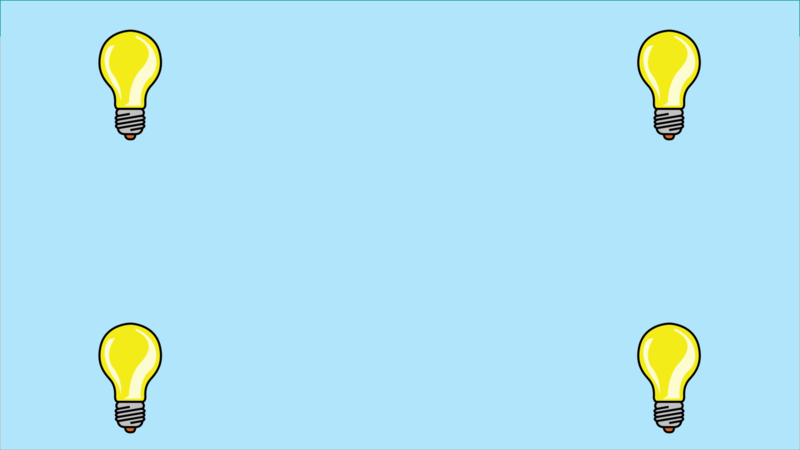 Standard communication board, designed as a base for the creation of individual boards. 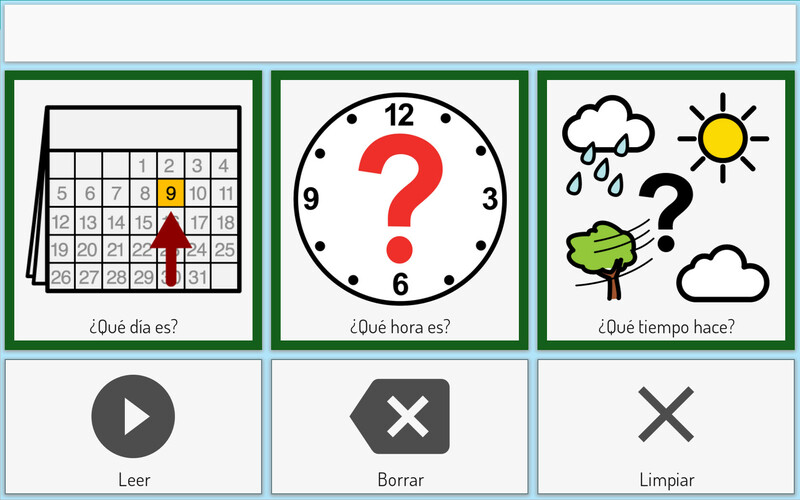 Communication panel to ask for puzzle pieces, also to ask for help when it can not be put and finally to say it is done. Tactile training. 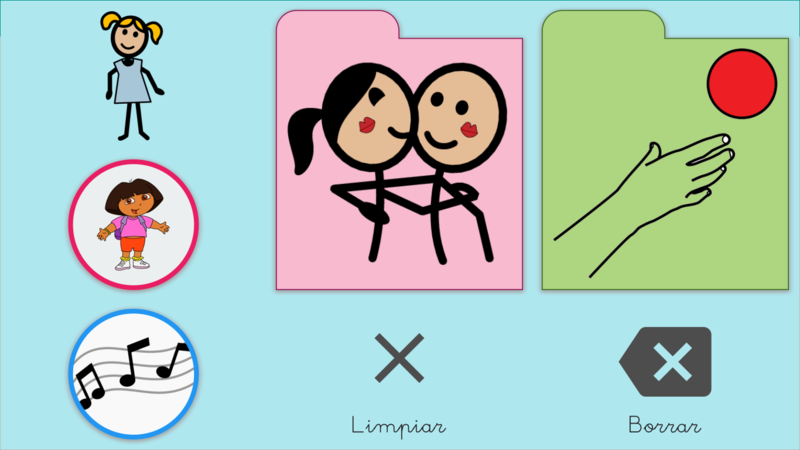 Cause-effect, to get a reinforcer the child has to touch the cell where the image appears. 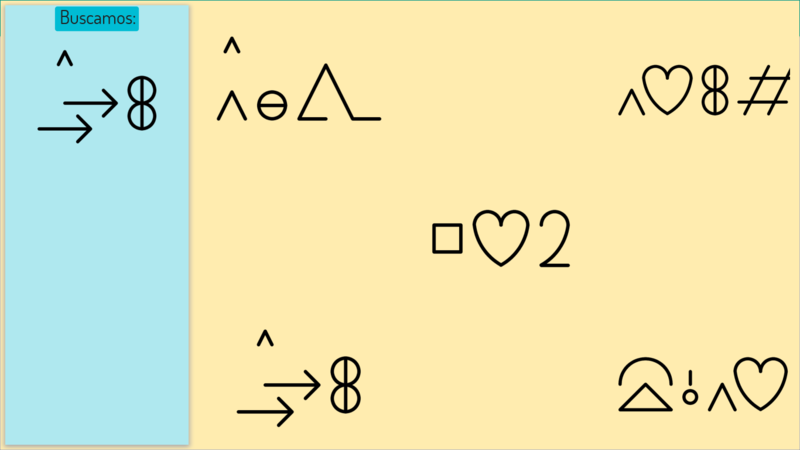 Simple boards with two message cells. Simple board made as College assignment. 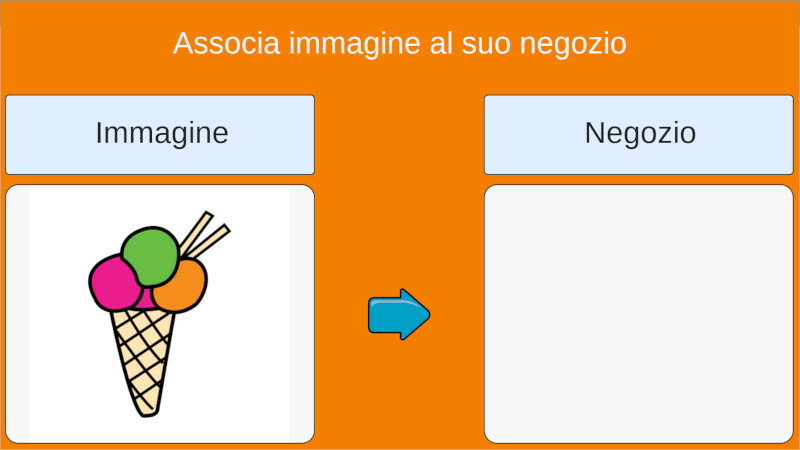 Associa immagine al suo negozio. Mario prepares a rock concert! Select from a bunch of things (objects, instruments, people) what you need to put on a rock concert. 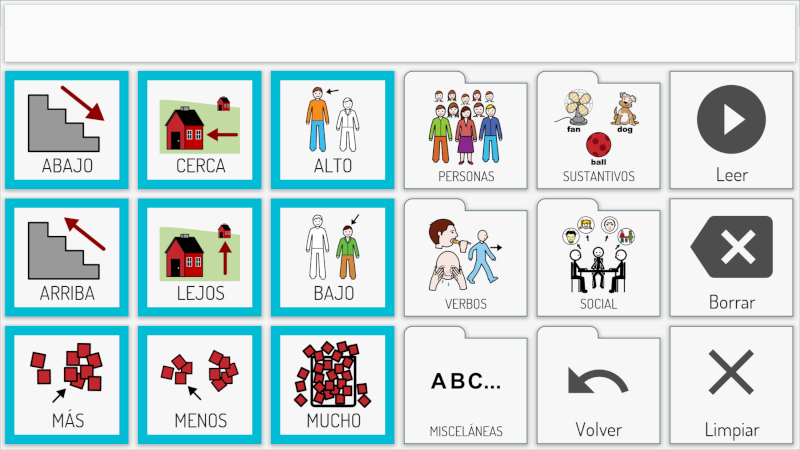 The selection is made during several pages of two cells with images or pictograms. Find the indicated geometric shape: square, circle, rectangle, rhombus, oval, sphere and cube. 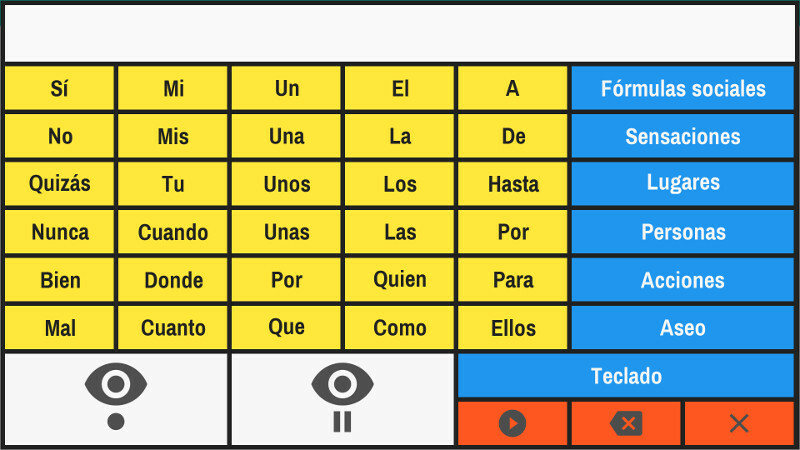 Communication board designed to combine the 120 most used verbs in our language. It includes quick talks phrases, questions, answers, opinions and more than 20 categories of vocabulary to talk about practically everything, as well as access to predictive keyboard, music and videos. 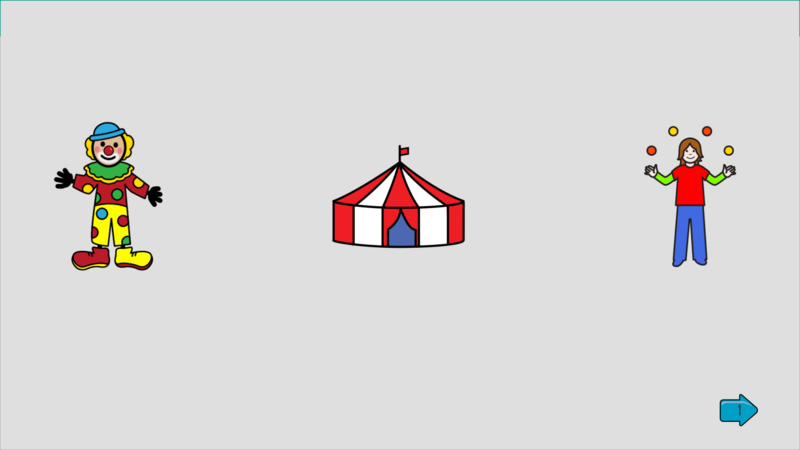 It combines the SAAC style with more variety of colors, pictograms and text. Objectives: Improve daily communication in basic and instrumental activities, favour self-determination and social interactions . Quale di questi elementi Ã¨ solido? 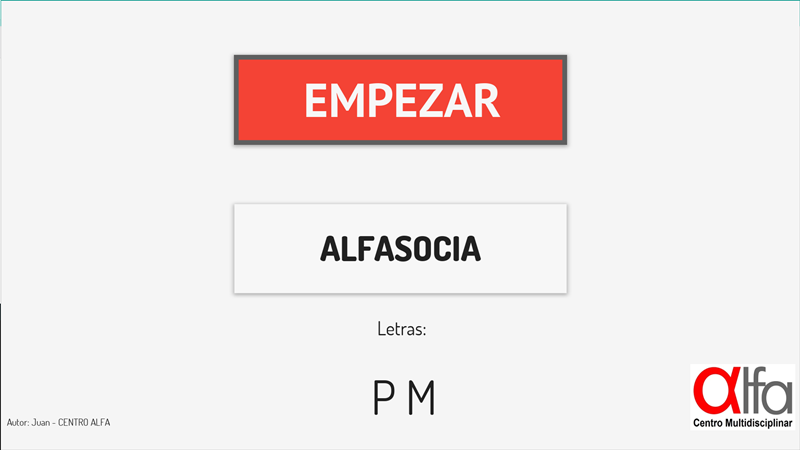 Bold letters and a high-contrast combination of colours for people with low visual acuity. Save messages as notes and retrieve them later. To use an adapted keyboard to express oneself in any situation. 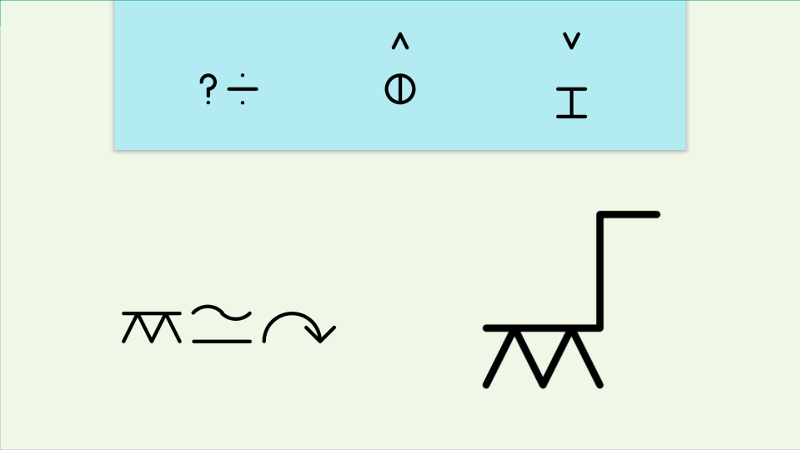 Communication board for the school environment that uses pictograms and calligraphic font with the SPC Outline style. It includes a page on common actions and names of classmates. 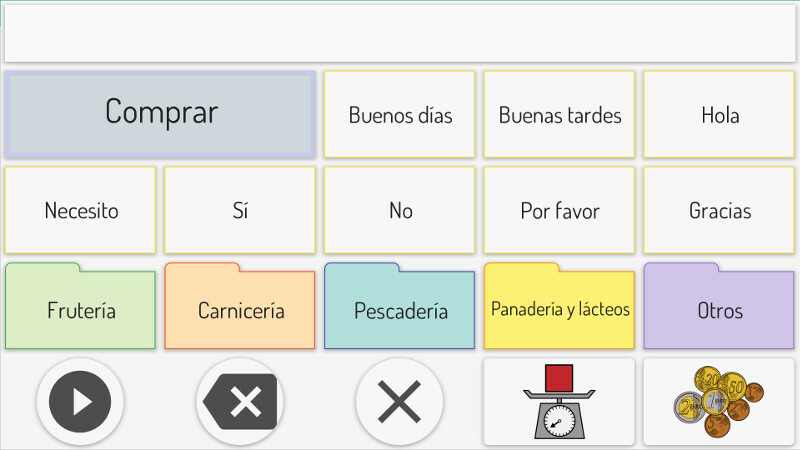 This version incldues notes, to save messages and say them later. Objectives: Communicate needs in the school environment, ask questions, express needs and improve the relationship with peers. 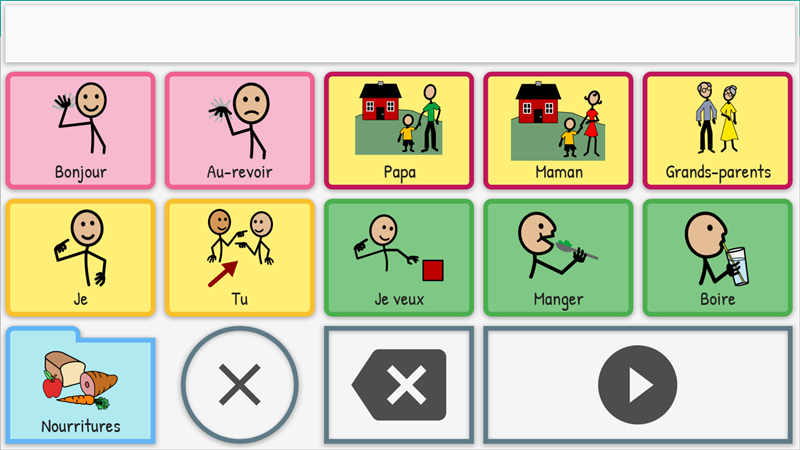 Sample board using the AAC system colour scheme. It includes categories of family, friends, colours, clothes, places and activities. This version includes notes to save messages and retrieve them later. 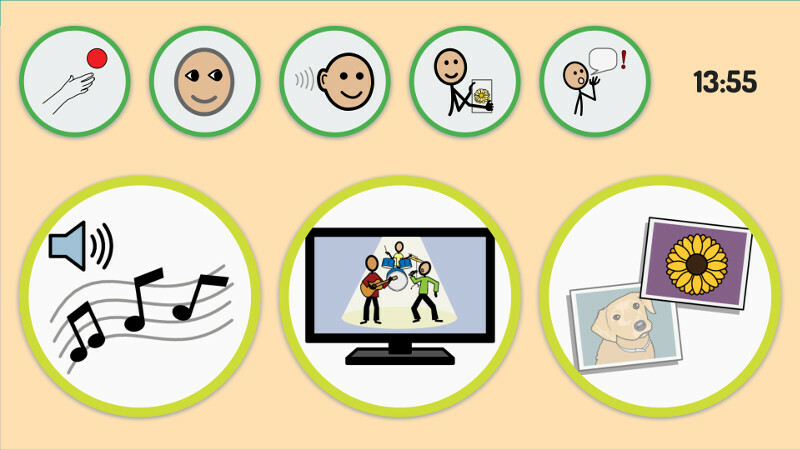 Objectives: Communicate daily needs, express feelings and activities with family and friends. Communication board to go shopping. It contains different categories of products, measures and money management. We recommend that you modify it by adding the products you buy most often. This version includes notes to save messages and retrieve them later. 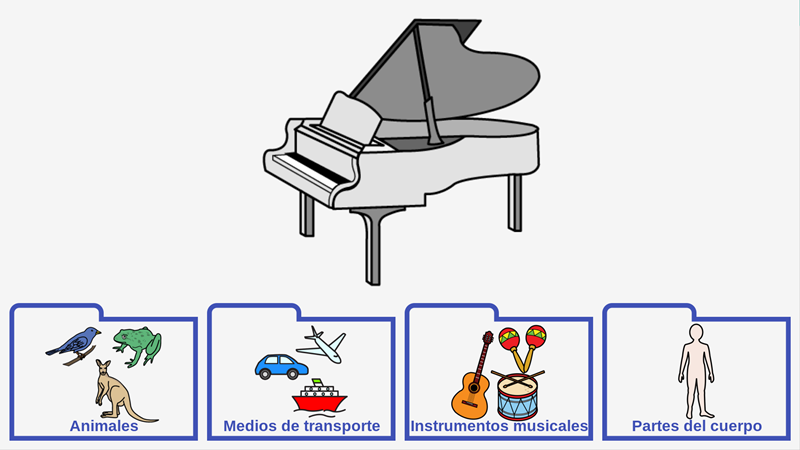 Objectives: To promote the autonomy in the instrumental shopping and money management activities. Try to find out which words are made up and which ones are real. This version saves the user's choices as pdf files. 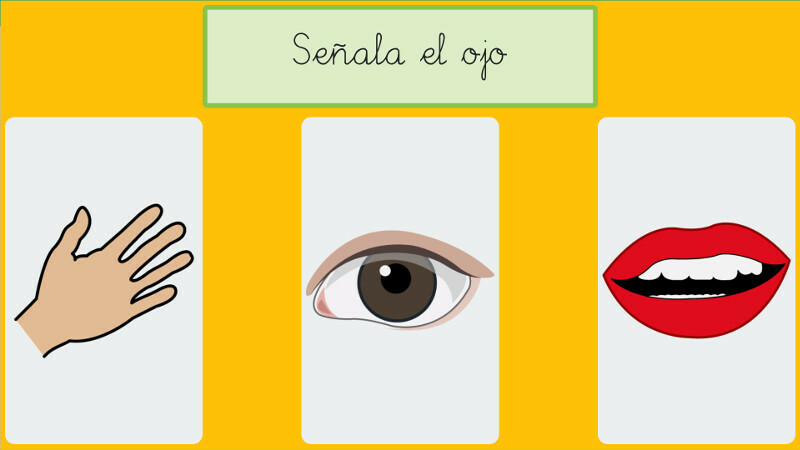 Objectives: Increase visual attention on reading and word identification, improve lexic access and widen your vocabulary. 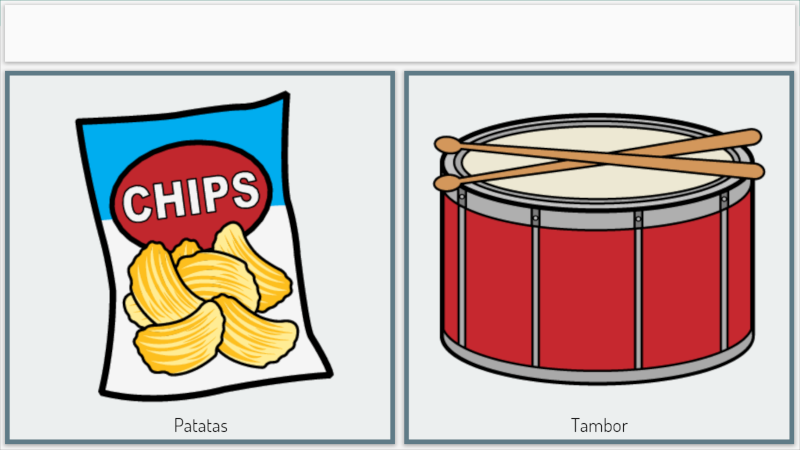 Find the semantic category for the displayed image. At the end, a page with the user's response and the correct results is shown. 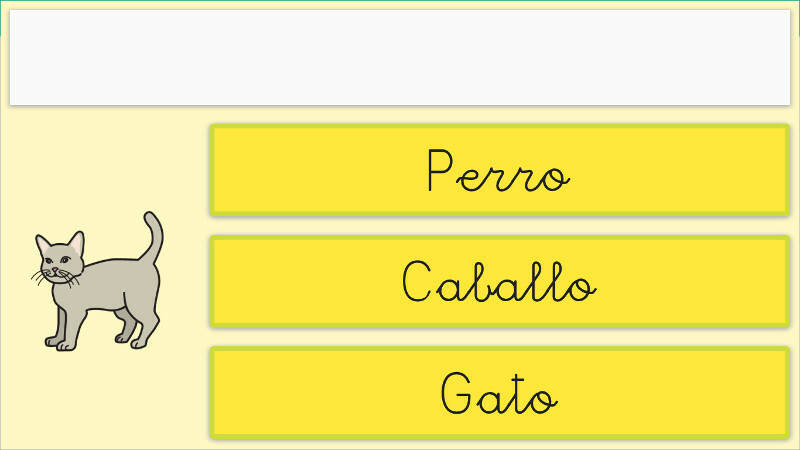 Select the correct animal according to the asked question. 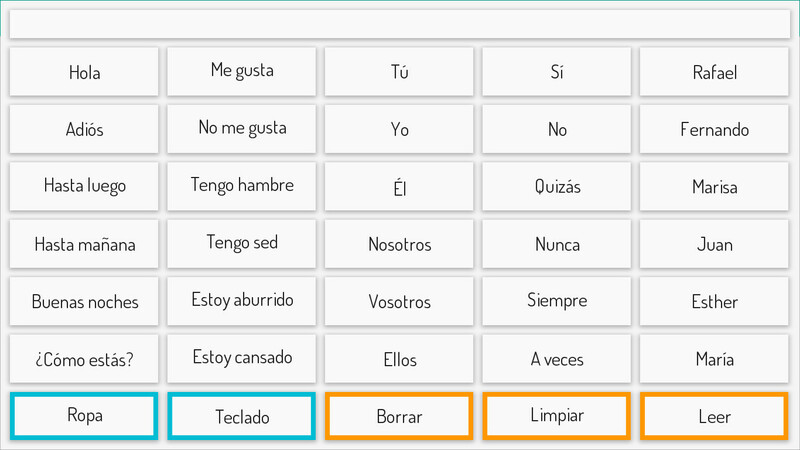 This version displays a result page with the expected and the user's choices. 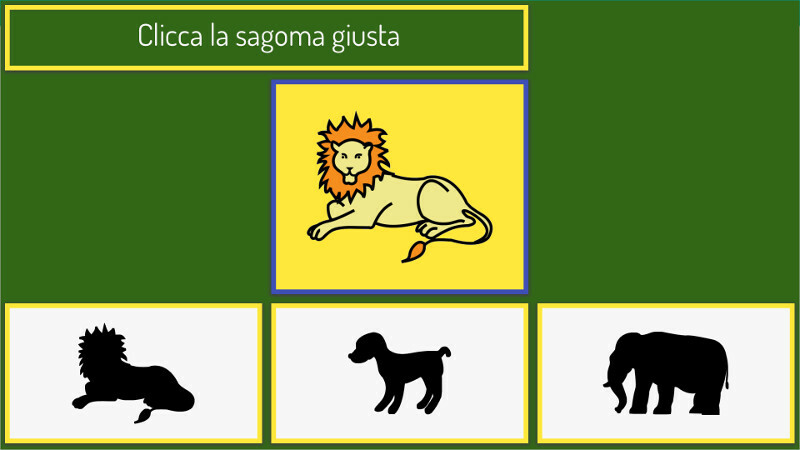 Increase visual perception and following instructions, improve comprehension skills and cognitive reasoning, foment semantic organization and widen animals vocabulary. Educational activity to find the image that does not fit among the others. 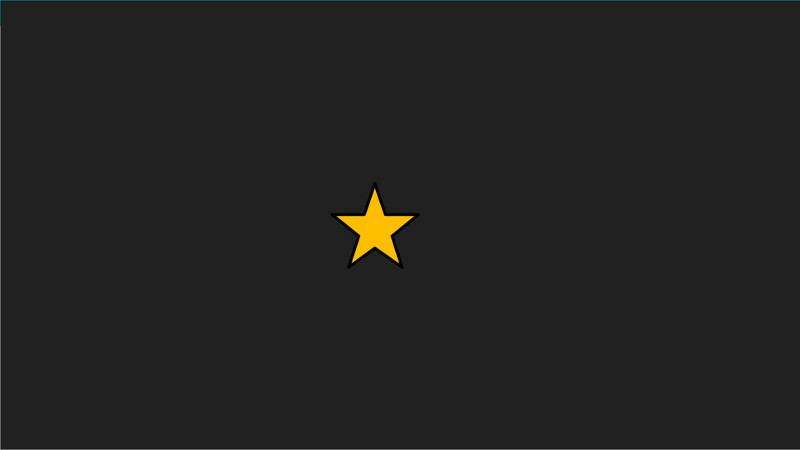 This version displays a page with the expected and the user's choices. Objectives: Develop observation skills and visual attention, improve reasoning and semantic organization, widen the vocabulary. Sort the groups of three letters in alphabetical order. At the end, a page with the expected results and the user's answers is displayed. 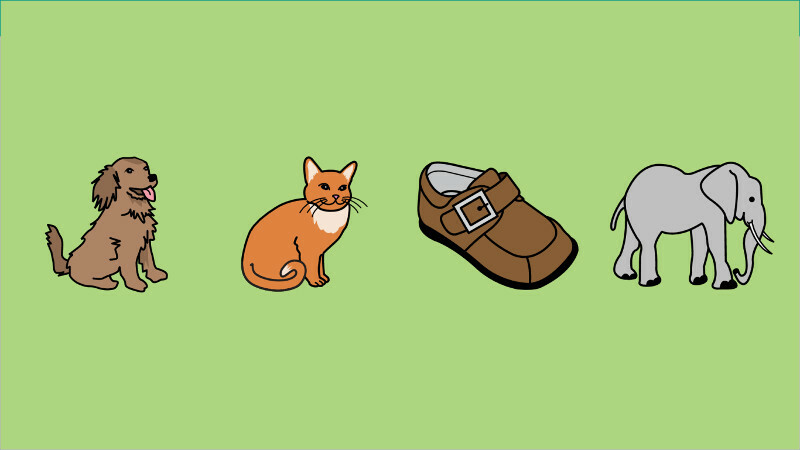 Can you find the word that rhymes? This version shows at the end a page with the expected choices and those of the user. 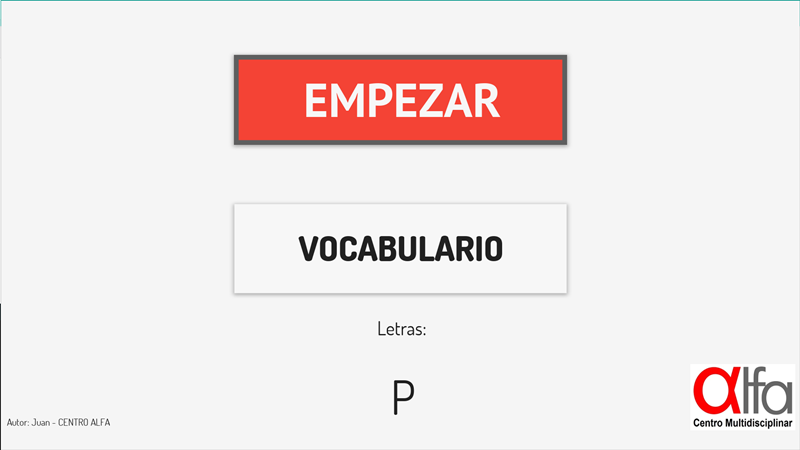 Objectives: Widen your vocabulary, improve auditive identification, visual attention and pronunciation. Learn about over 16 wild animals! 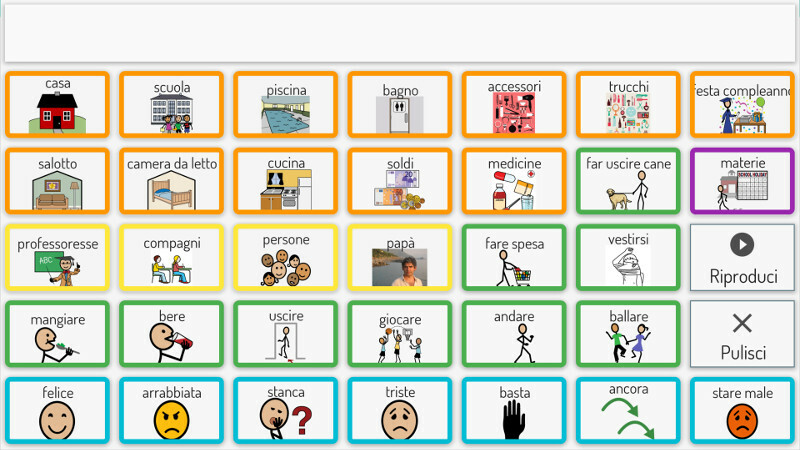 Activity board (in Italian). Find the animal and discover its characteristics. 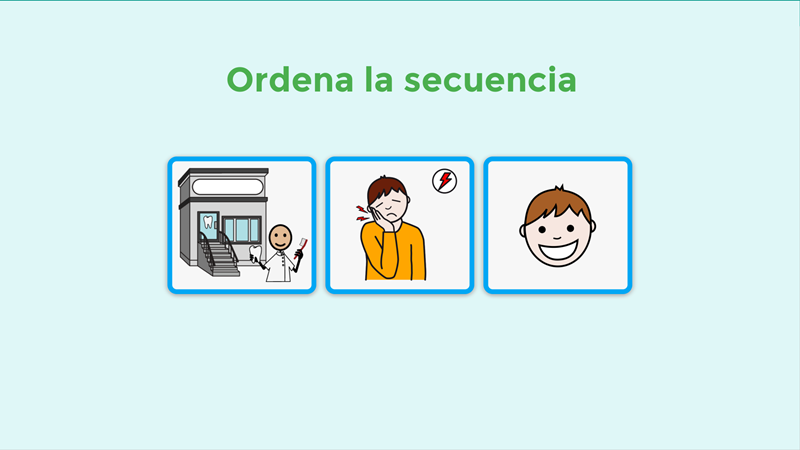 Objectives: To work on hearing and reading skills, increase vocabulary and improve the visual identification of images to choose between different alternatives. Try to discover the animal to which the question refers. 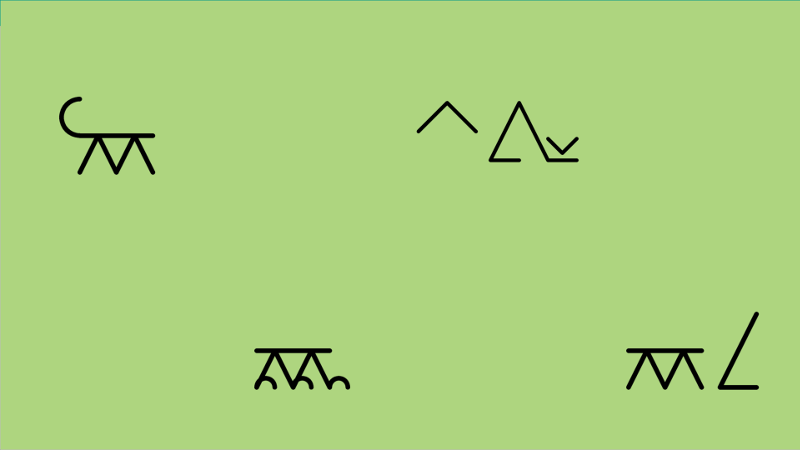 This activity combines pictograms with calligraphic letters. 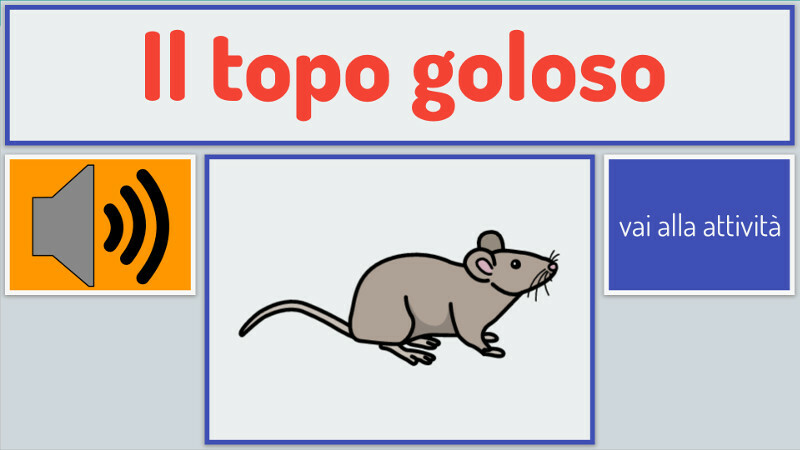 Objectives: Increase visual perception and following instructions, improve comprehension skills and cognitive reasoning, foment semantic organization and widen animals vocabulary. 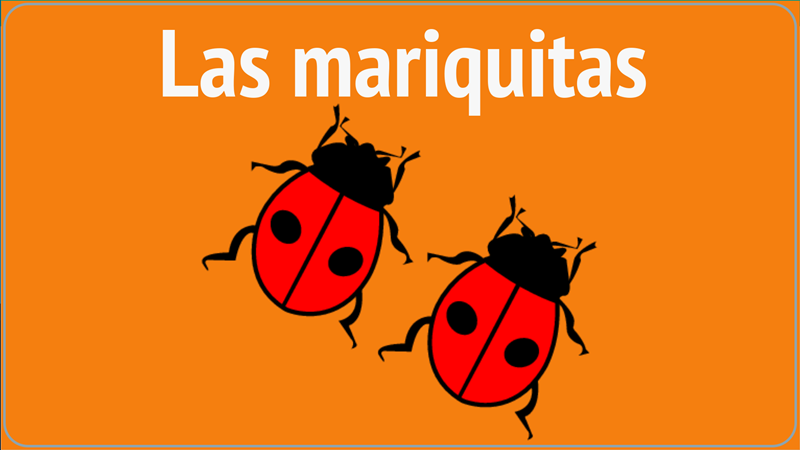 How many ladybugs are there? 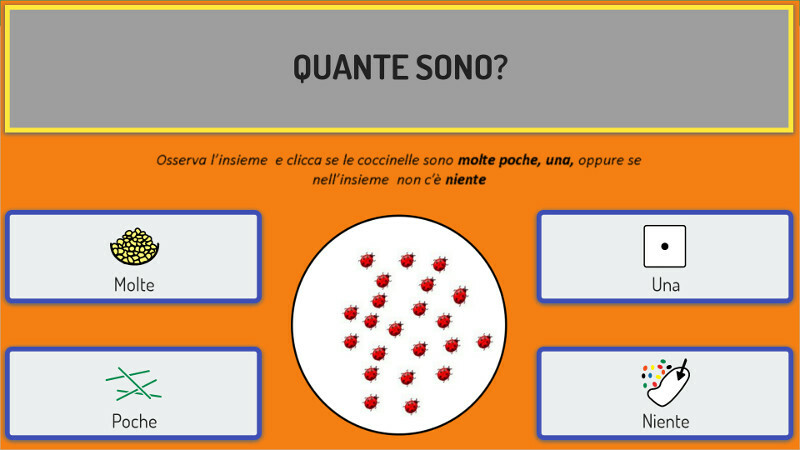 Activity board in Italian language to select the corresponding amount of ladybugs with visual help: few, many, one or none. 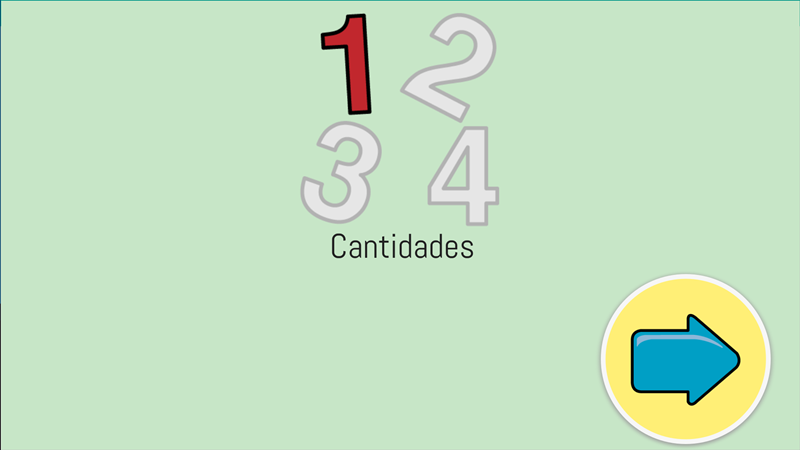 Objectives: Understand quantity concepts, recognize quantities and select between four options. 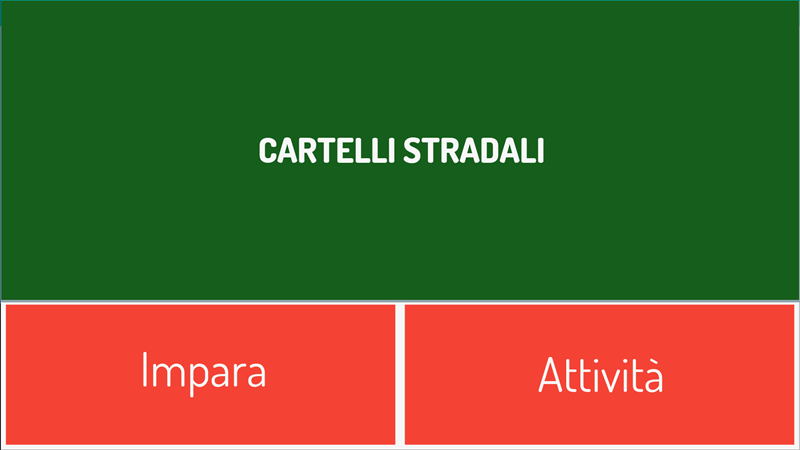 Activity board (in Italian). Choose the corresponding antonym for a word. 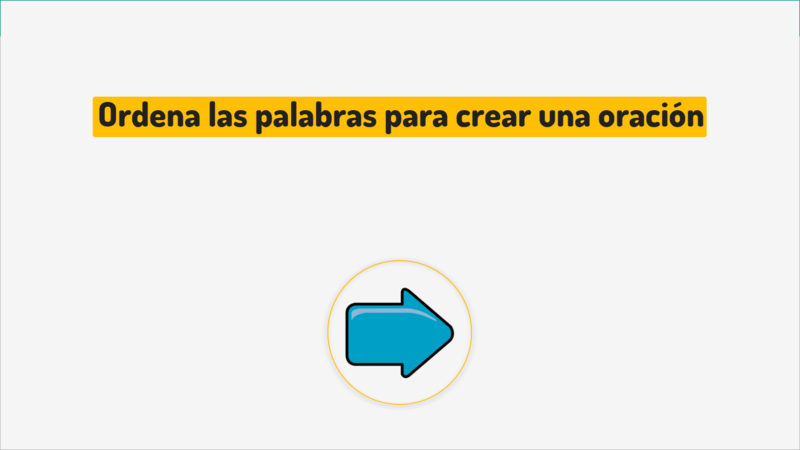 Objectives: To improve understanding, reinforce listening and reading attention, increase vocabulary and work on the choice between three alternatives. 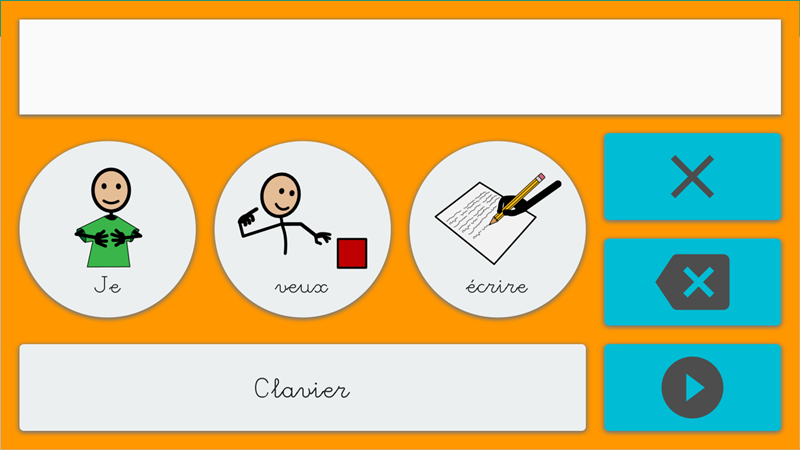 Simple board that combines images and words with the SPC style. It is the sample board created in the user manual of the program. 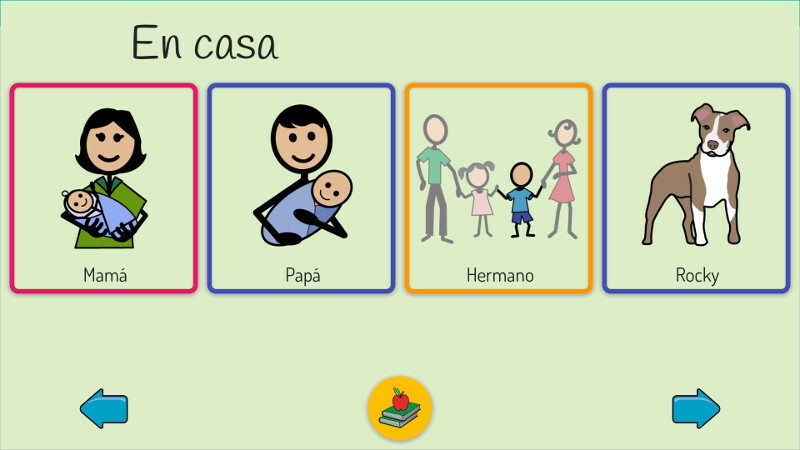 It includes social forms, family and basic verbs in the home, along with a second page of food. 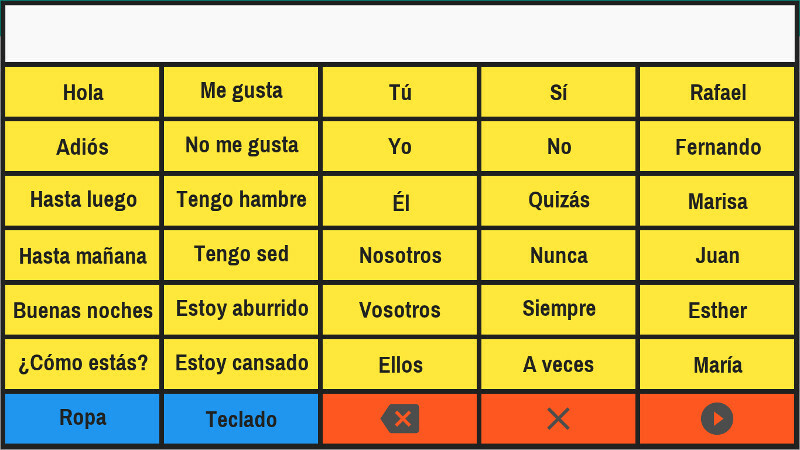 Objectives: Learn to use a Verbo board. 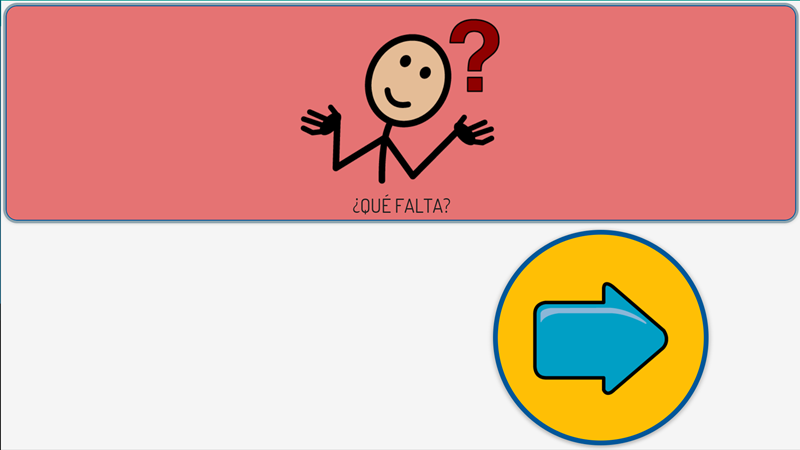 Communication board for the school environment that uses pictograms and calligraphic font with the SPC Outline style. It includes a page on common actions and names of classmates. 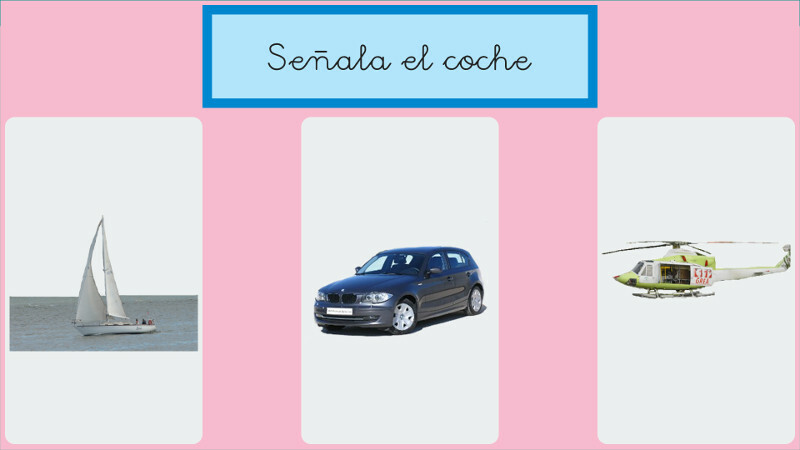 Educational activity to find the image that does not fit among the others. 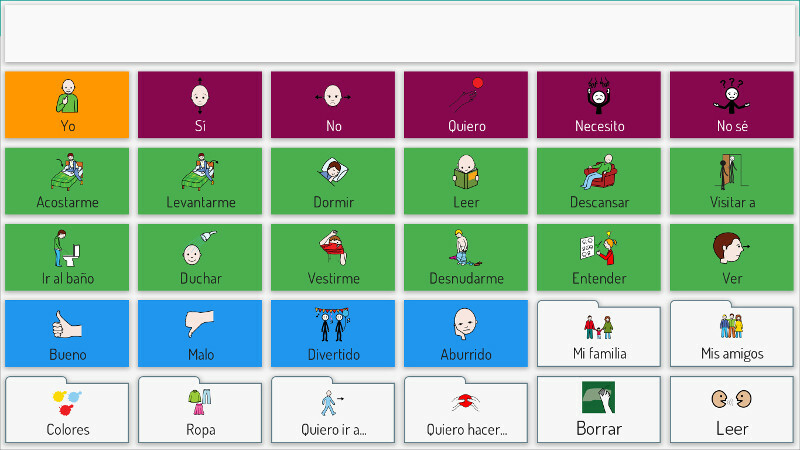 A board that uses the colours of the AAC It includes categories of family, friends, colours, clothes, places and activities. 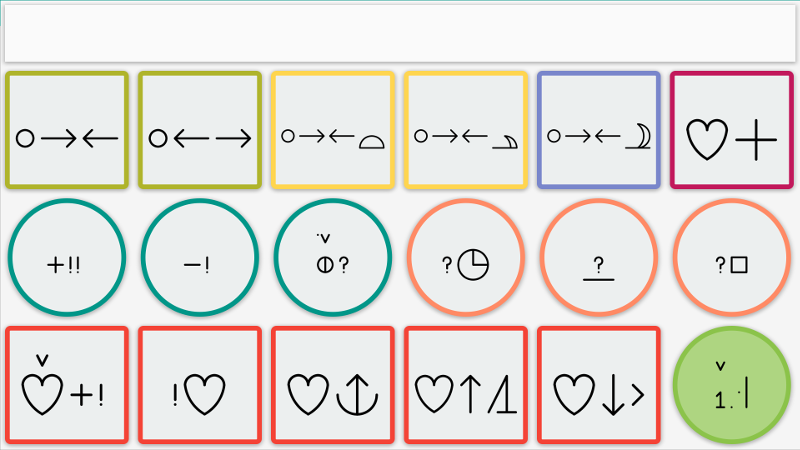 Sample board using the AAC system colour scheme and symbols from ARASAAC. 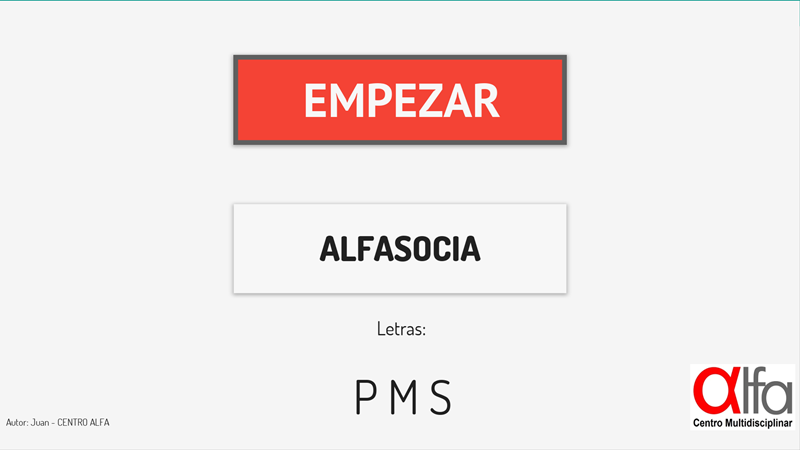 Bold letters and a high-contrast combination of colours for people with low visual acuity. Sample board without pictograms and a minimalist look. 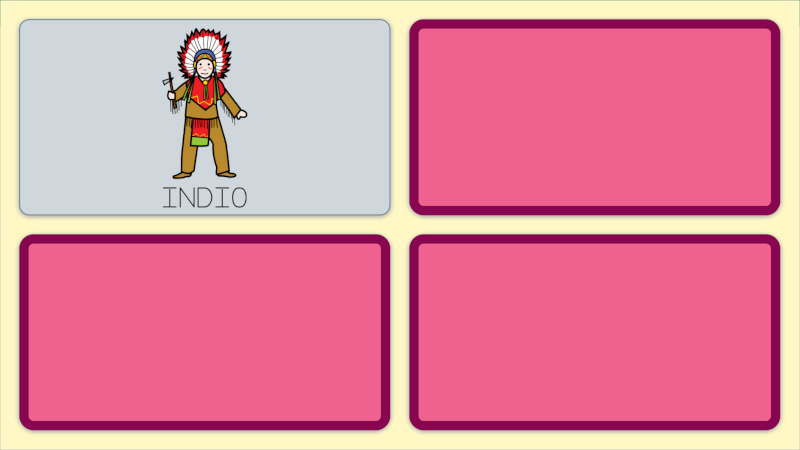 A simple board with few cells and large images so you can tell some things about you. 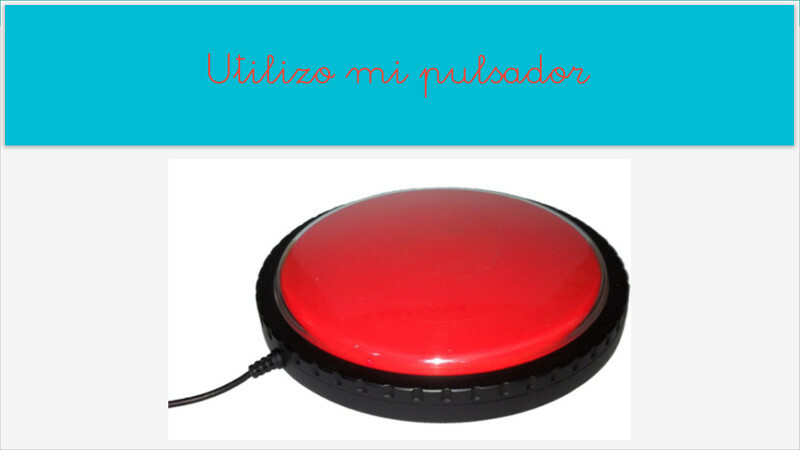 Objectives: Learn to use a Verbo Board to introduce yourself. 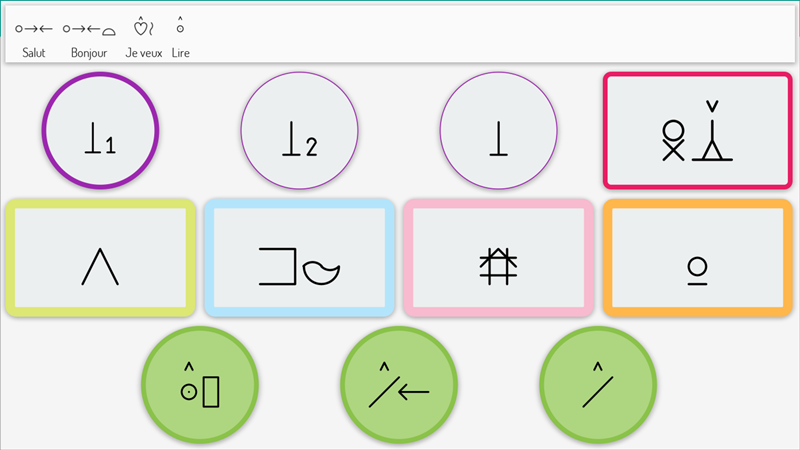 Besides the alphabetic keyboard with a typewriter look, the main page includes some social forms and it combines SymbolStix pictograms with text. 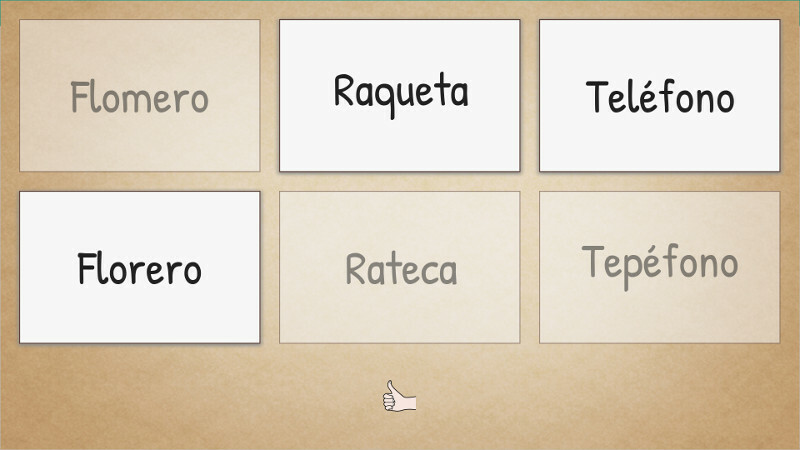 Objectives: Access to social forms and use the alphabetic keyboard. 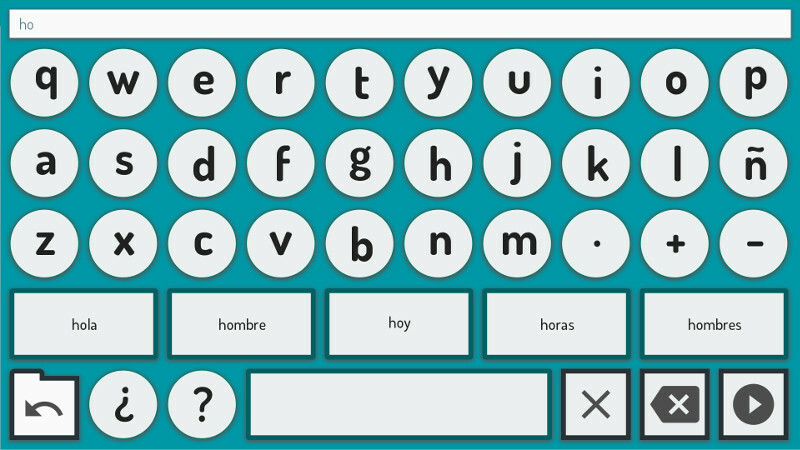 A keyboard that combines letters and pictures. 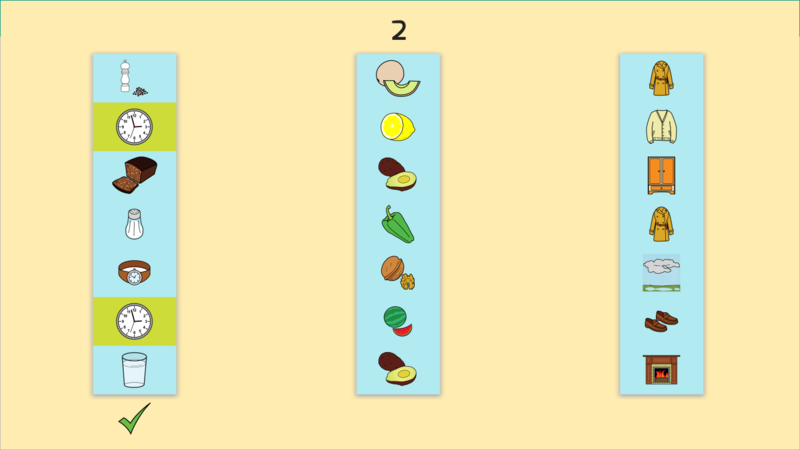 Communication board of food with large images and differents categories. 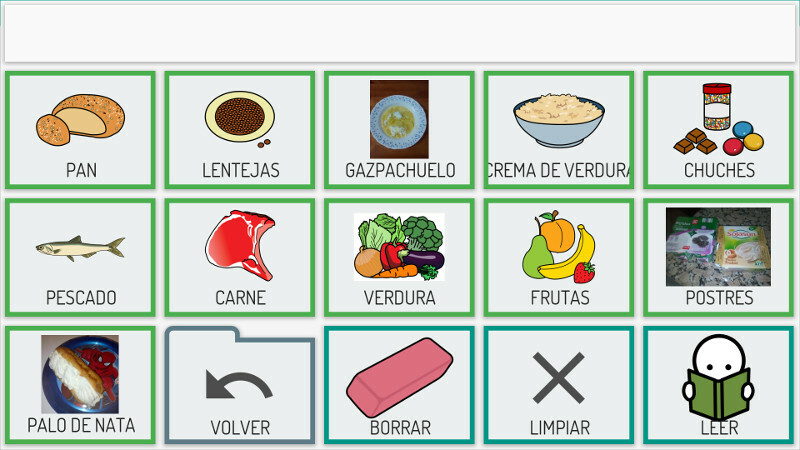 Objectives: Decide and express your food preferences, favour self-determination and understand food categories. What word is missing in the sentence? 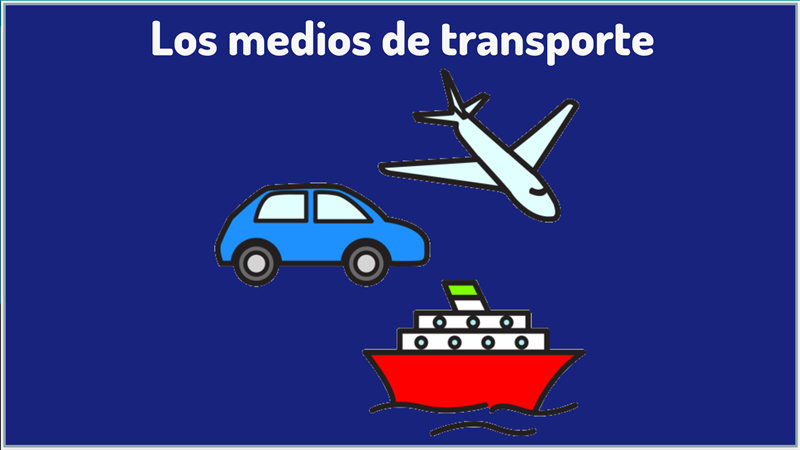 Use the pictograms as a hint. Objectives: Improve reading comprehension, logical reasoning, visual identification and syntactic structure. 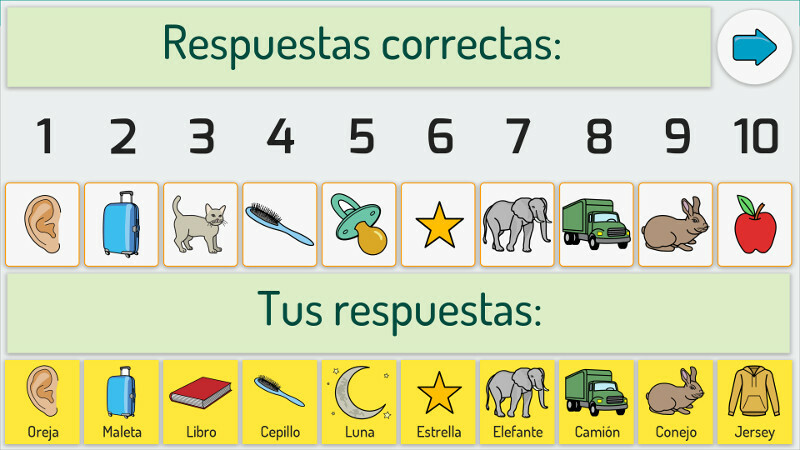 Version of the Compare animales board with ARASAAC symbols. 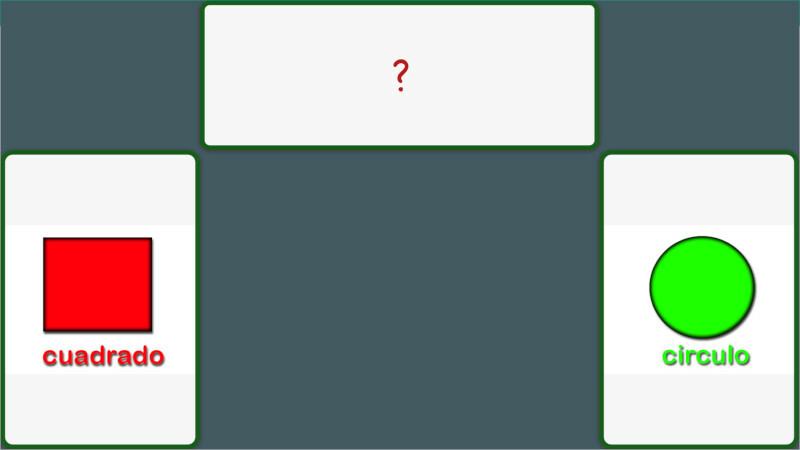 Match the displayed image to its name. Objectives: Start in literacy of whole words, identify images and recognise the words of its name. Try to find the image you've seen a few seconds ago among all the others. 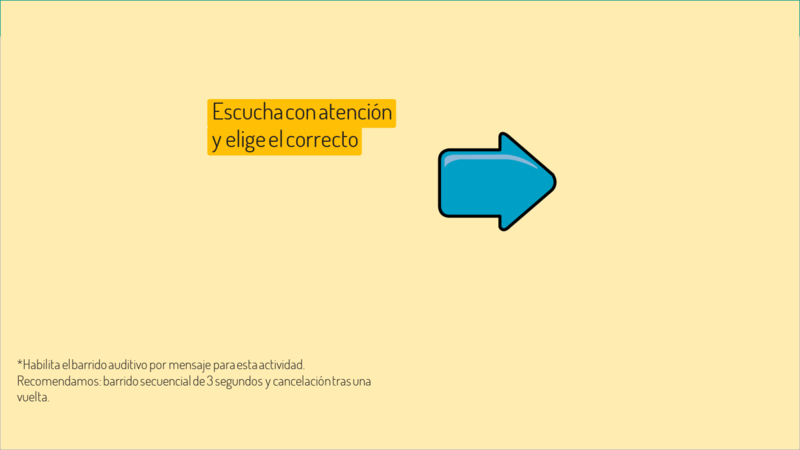 Objectives: Improve searching skills and visual identification, increase attention and visual memory. 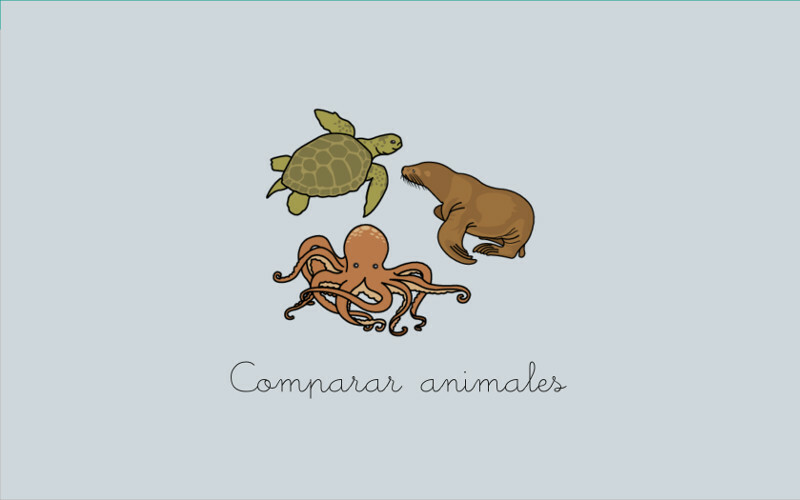 Pets, wild and farm animales. Where they live and their characteristics. 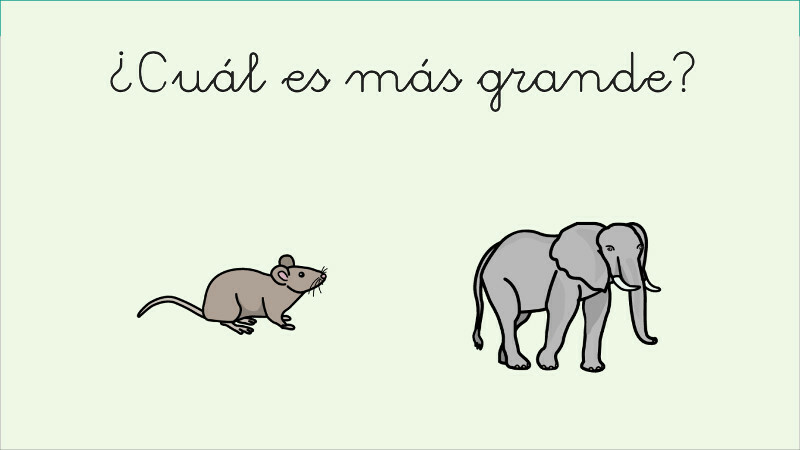 Objectives: Wide animals vocabulary, improve categorization, favour educational skills and environment understanding. What day is it? What time is it? What is the weather like? Objectives: Get or keep orientation skills, plan activities or events in special times of the year. 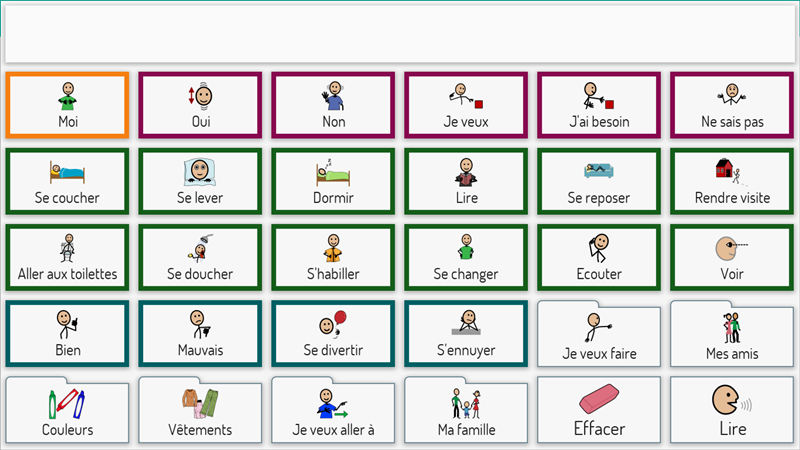 Communication board of everyday activities that includes over 40 categories to talk about your preferences and needs. 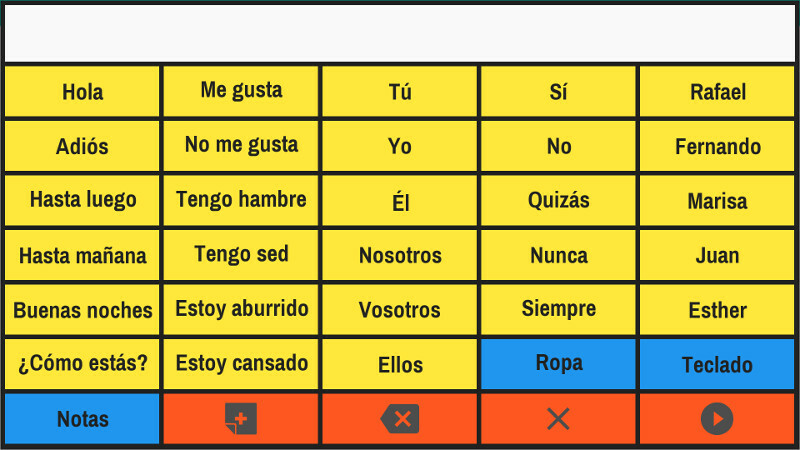 Combine Verbo style with different colours, pictograms and text. 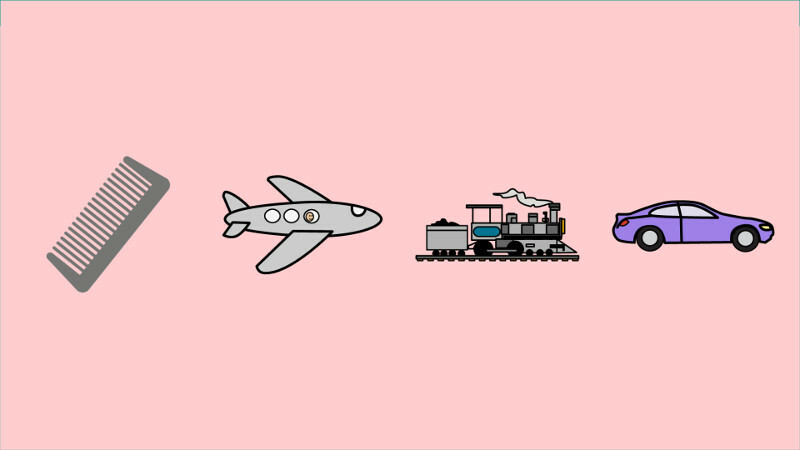 Can you find the word that rhymes? 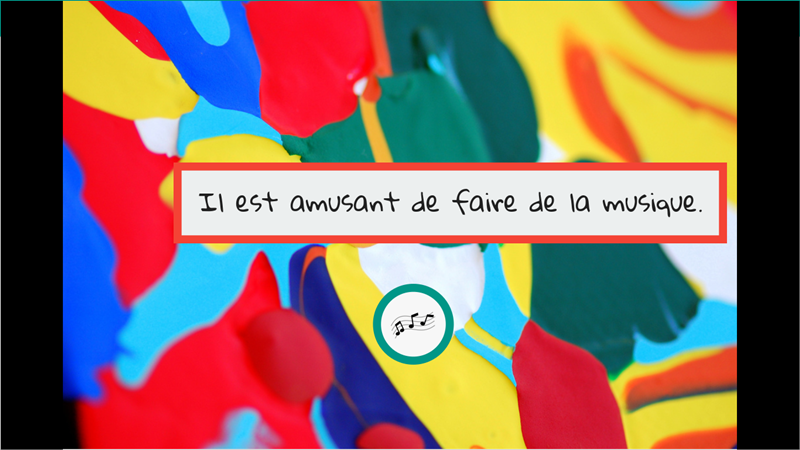 Identify the word that does not fit in the sentence. Objectives: Improve word identification, reading comprehension and logical reasoning. Try to find out which words are made up and which ones are real. 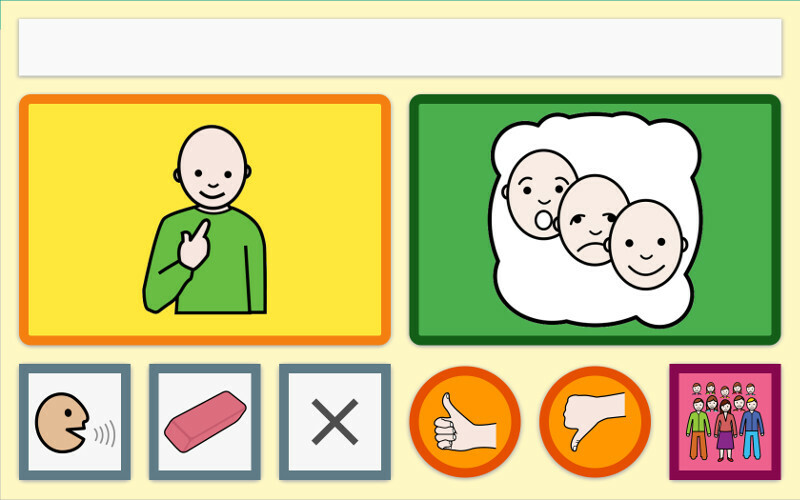 Template of a work session of therapy designed with AAC style without text. Objectives: Favour visual sequence of work, foresee activities, and facilitate needs communication during the session. 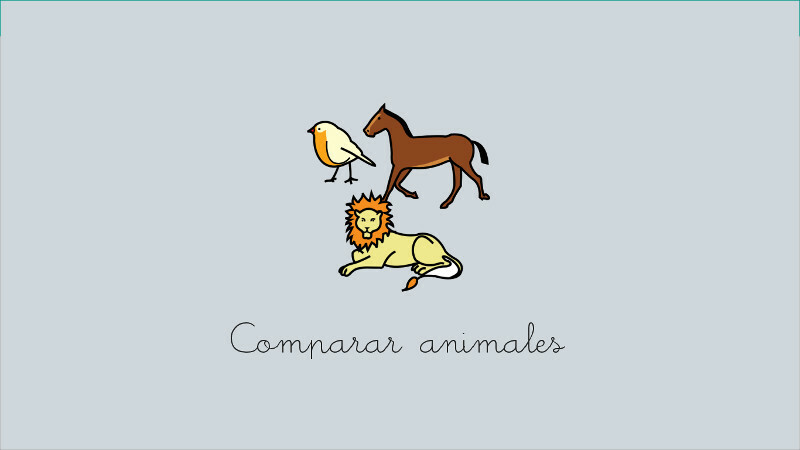 Version of the Compare animales board with real animal sounds. Sample board using the Bliss communication system. Objectives: Express needs, feelings and daily activities, improve communication with immediate surroundings. The owl loves working at night singing every hour, but when the day comes he is very tired! Discover the animals that hide in the forest, and show what you have learnt with the activities included at the end. Objectives: Improve images understandig, widen the vocabulary, increase attention and memory process, strengthen social skills in specific context, etc. What do you want to eat? Say it with this board full of fruits, vegetables, legumes and meats. 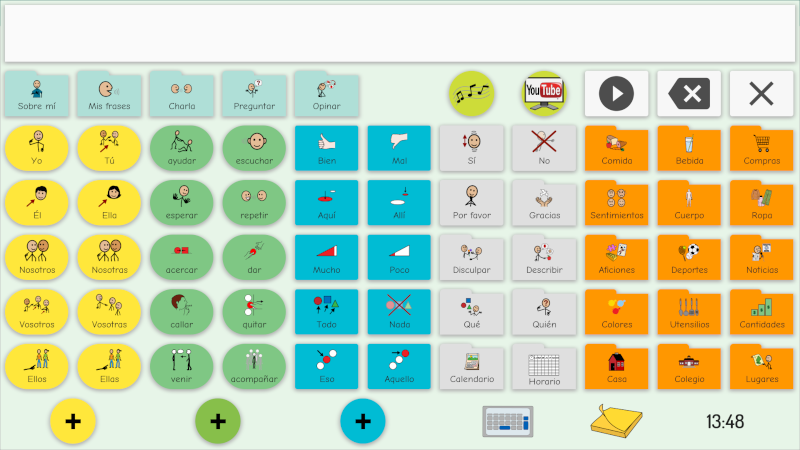 This board combines Verbo style with colours, pictograms and text. Objectives: Facilitate self-determination, increase expression of details in food preferences and indicate people to share it. 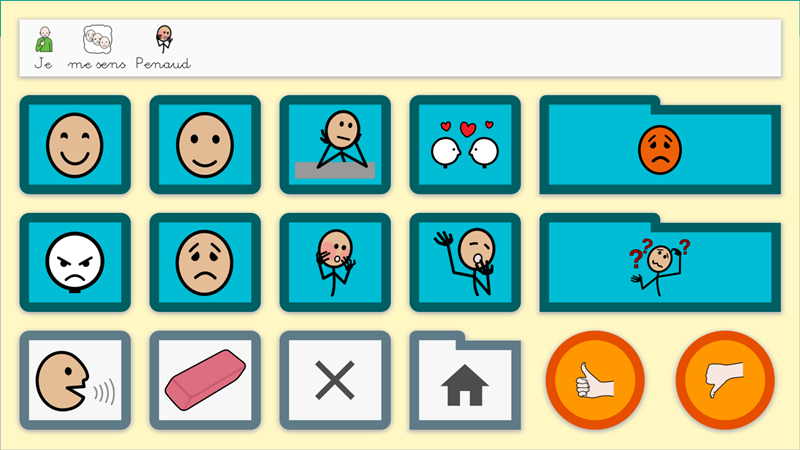 A board designed with AAC style without text to speak about feelings and sensations through symbols. Objectives: Express feelings, describe specific pains and connect situations with social environment people. Objectives: Understand quantity concept, work in basic concept greater/less and improve maths reasoning with numbers comparison. 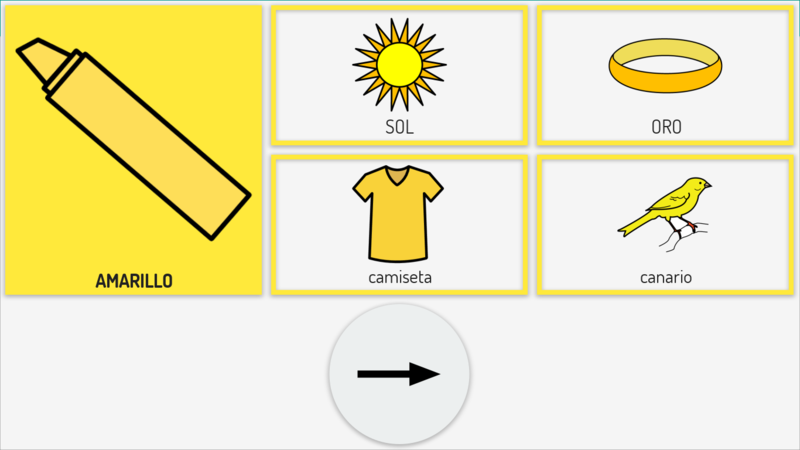 Communication board with text and pictograms. It includes feelings, illness, parts of the body, problems and people categories. Objectives: Express feelings, describe specific pains and connect situations with family and friends people. 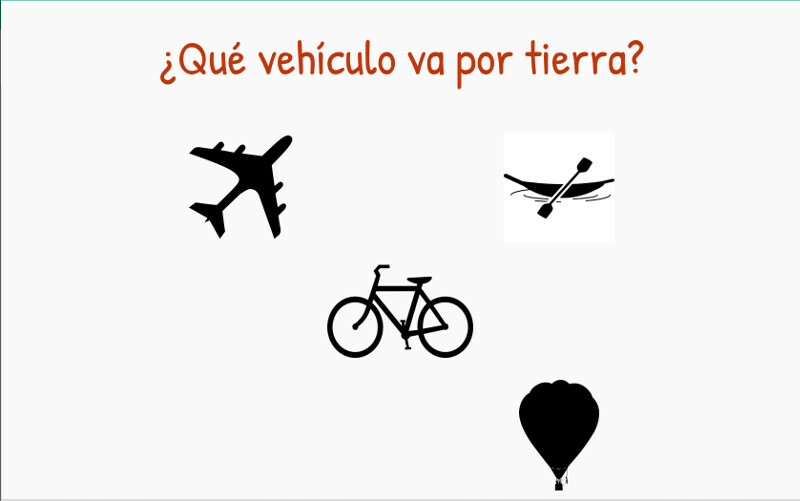 Can you identify the means of transport referred to by the question from its shadow? Objectives: Improve visual recognison, increase attention and identification of images, favour following instructions and widen transport vocabulary. 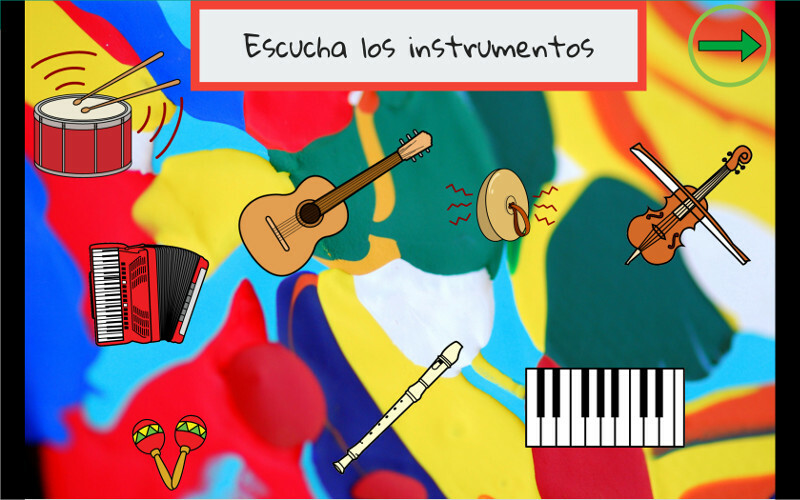 Discover the sound of each musical instrument and try to recognize them. Objectives: Strengthen auditive attention, improve concentration, favour active listening process and sound recognition. 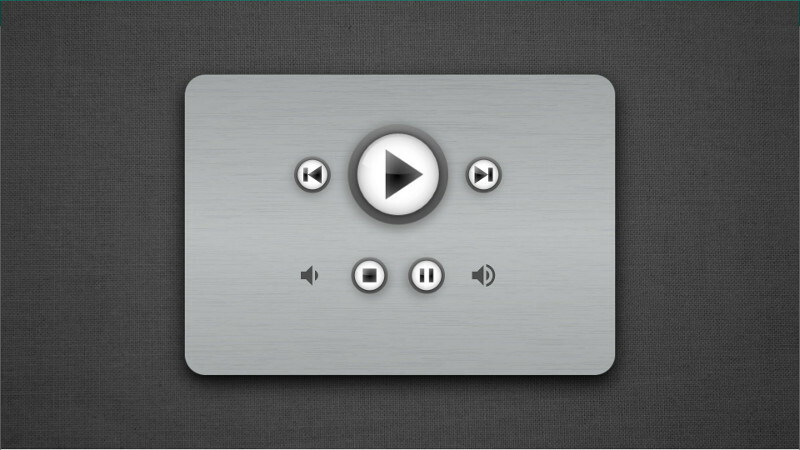 A player that you can use to listen to music from your computer. Objectives: Favour self-determination, increase self-esteem, play your favourite music, control volume and change songs. 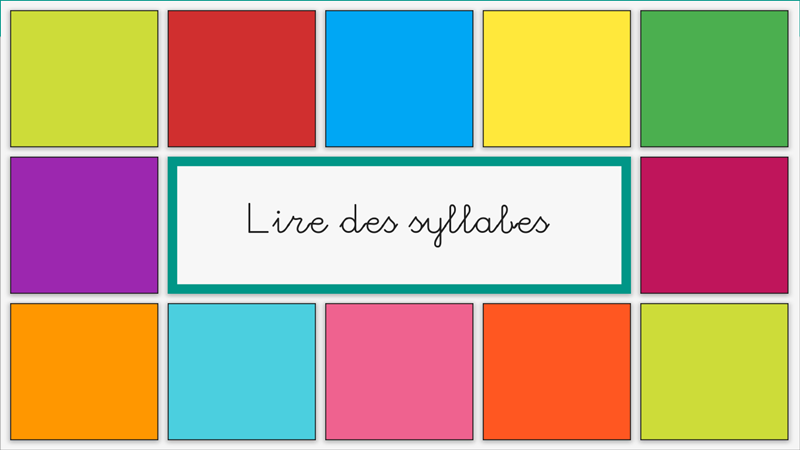 Write the syllables of the word to pass to the next level. Task sequencing for children with difficulties in planning. The cells provide visual information on what has already been done and what should be done next. Objectives: Acquire daily routines, improve the temporal organization of basic activities, increase safety and self-esteem and, in this case, facilitate resting. Communication board to go shopping. It contains different categories of products, measures and money management. We recommend that you modify it by adding the products you buy most often. Can't wait for Christmas day? Get this advent calendar to shorten this endless wait! 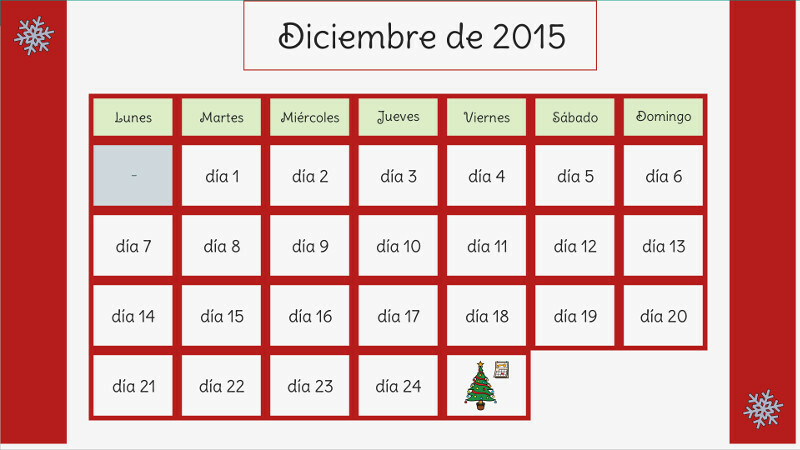 Do the everyday activities and have fun with the countdown to holidays. Objectives: In addition to facilitate time orientation skills, the included activities improve maths concepts, logical reasoning, memory, language and social-affective skills. 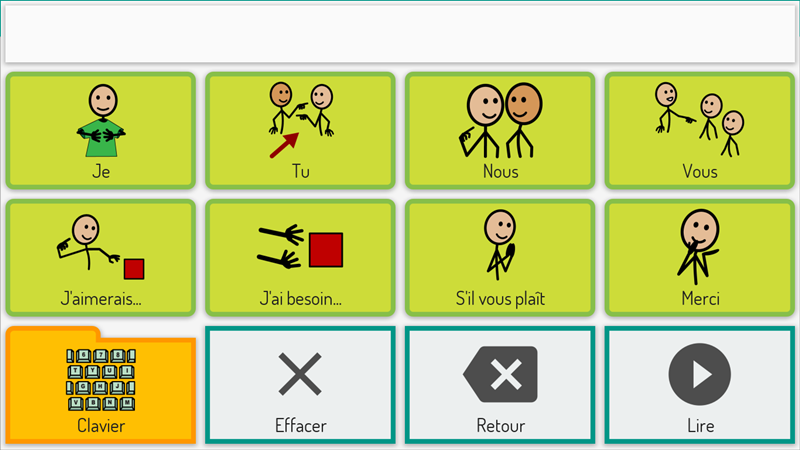 Communication board by literacy. 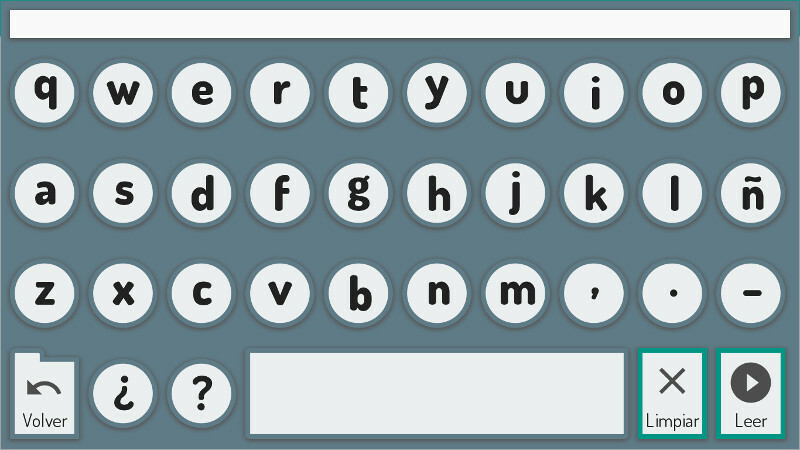 Combine the alphabetic keyboard with some frequent syllables and words. Objectives: Increase expression speed of people by using literacy. 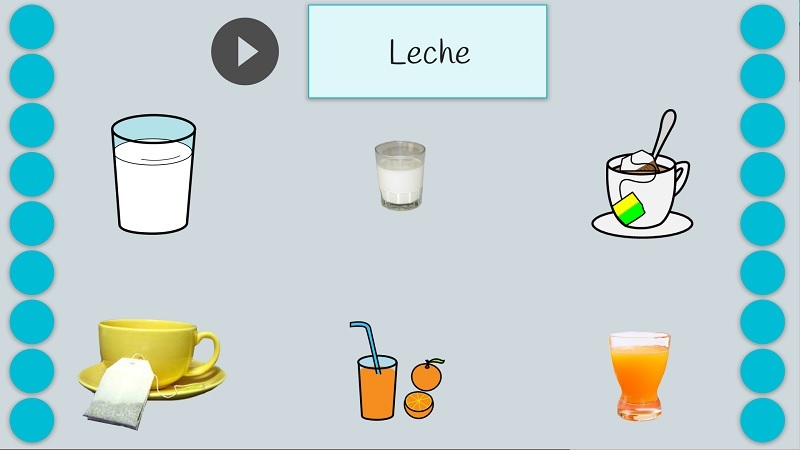 Introduce new symbols in daily vocabulary. Listen the word and then search the corresponding photo and symbol. 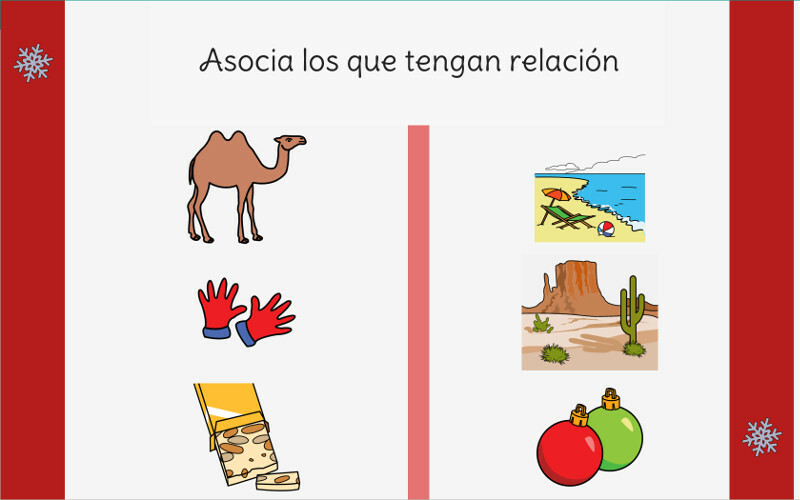 Objectives: Learn new symbols by the association of verbal words, photos and symbols. 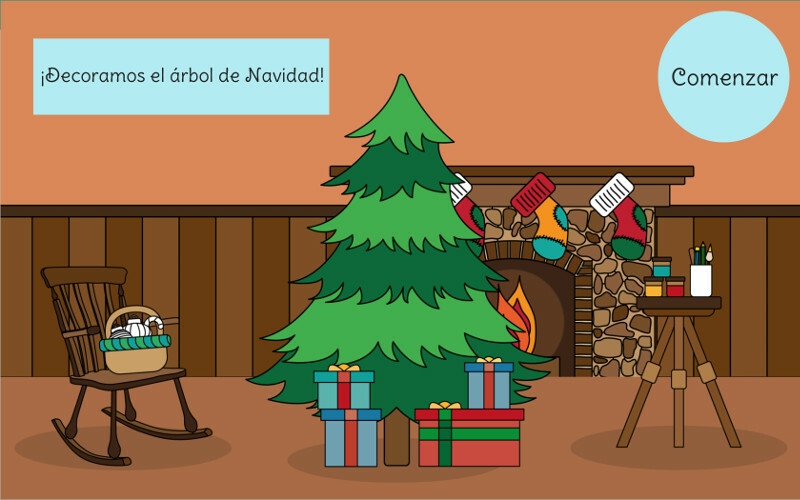 Follow the instructions to decorate the Christmas tree. 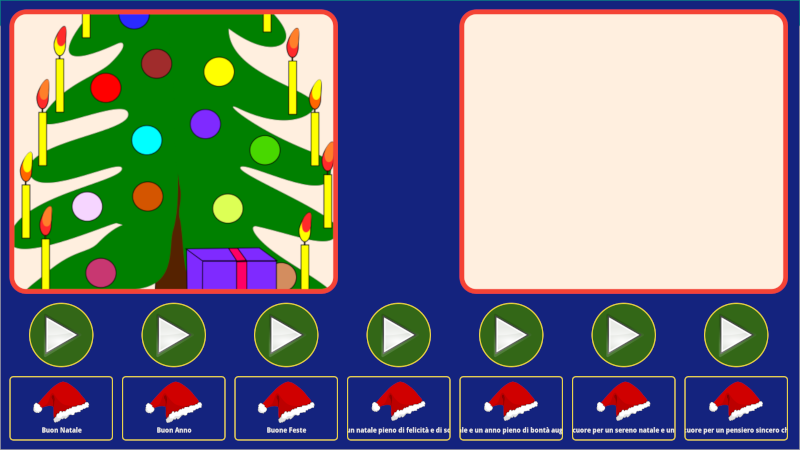 Objectives: Get start with cause-effect, get acquainted with the screen, improve following instructions, strengthen task sequencing, favour the starting and ending of activities, anticipate Christmas atmosphere. 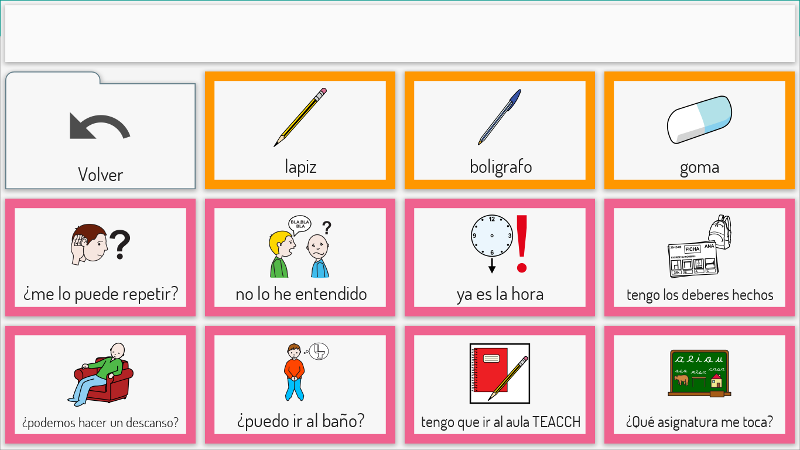 Communication board by literacy. 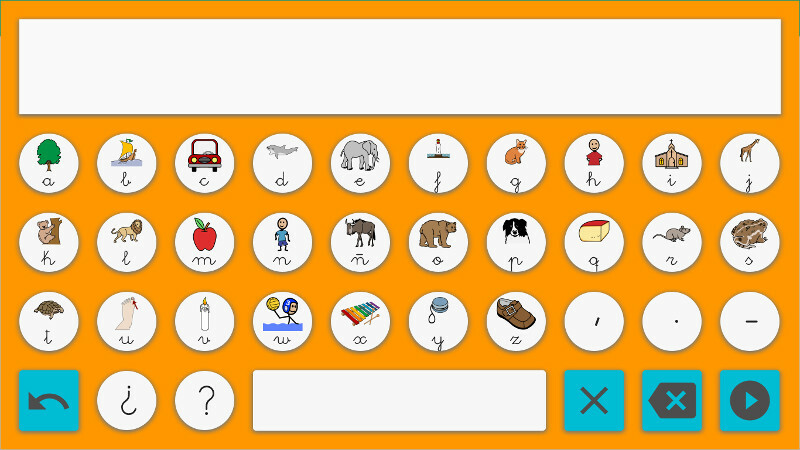 Combine the alphabetic keyboard with some frequent syllables and words. 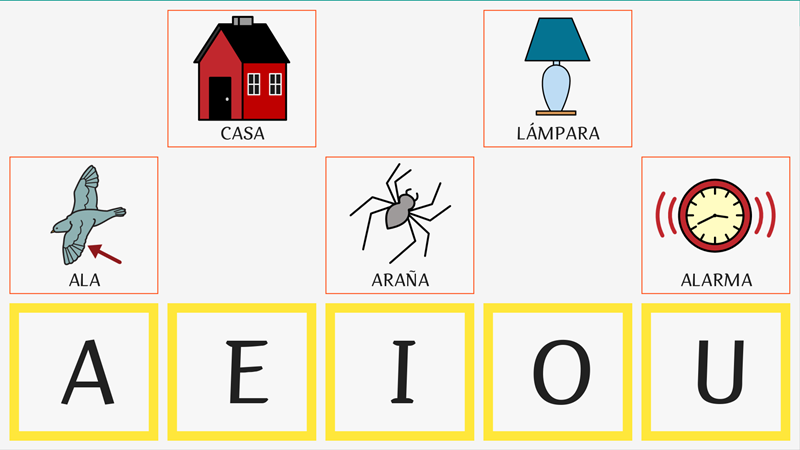 Each letter suggest some syllables combination for a better communication. Link Christmas images with a common feature. Objectives: Improve semantic comprehension, strengthen concept association, favour logical reasoning and widen Christmas vocabulary. 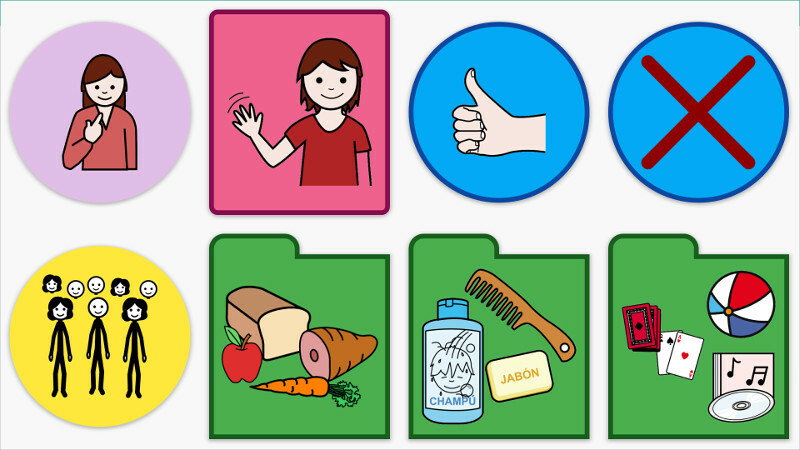 Task sequencing for children with difficulties in planning. 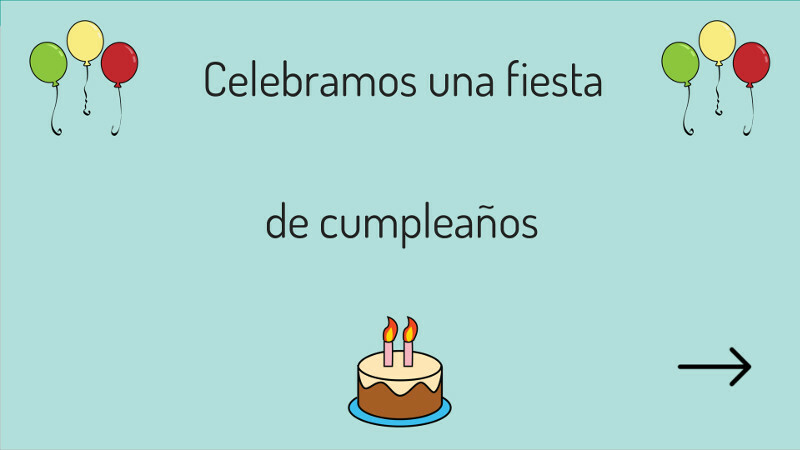 Objectives: Anticipate the common activities in a birthday party, increase self-confident and security feelings, improve the comprehension of socio-behavioural activities in that context and facilitate the adaptation to changes. 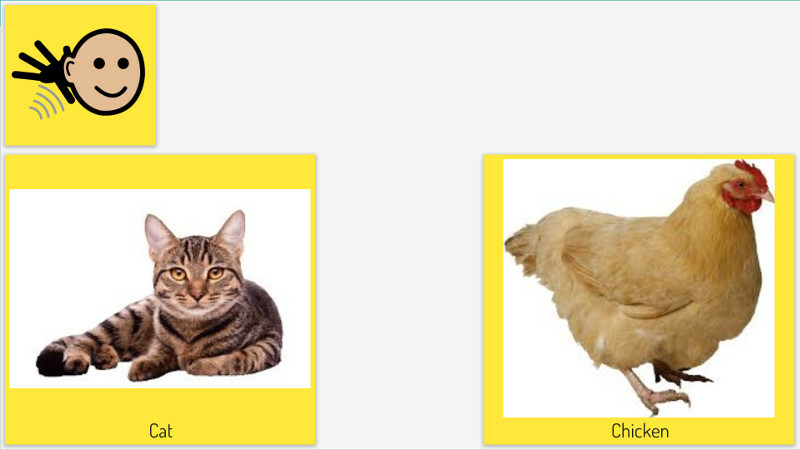 Simple images recognition activity. Listen carefully the instruction and select the correct image between two options. It's ideal for training with switches or eye tracking systems. Objectives: Improve your vocabulary, identify semantic categories, strengthen logical reasoning and start training with computer access systems. Identify the appropiate parts of the body between three options. It's ideal for training with switches or eye tracking systems. Objectives: Strengthen body vocabulary, improve following instructions and start training with computer access systems. 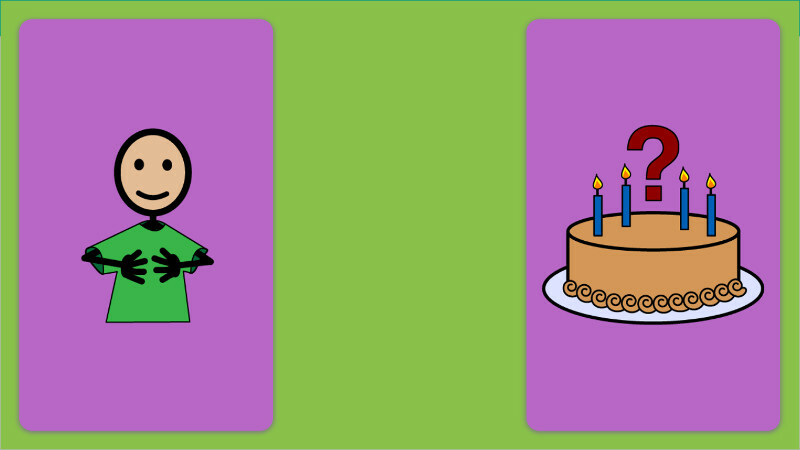 With this activity you will learn to do additions with whole numbers. Objectives: Improve the addition of whole numbers, working on mathematical reasoning, memory and attention skills, and enhance the choice between several options. Bold letters and a high-contrast combination of colours for people who use a gaze control. 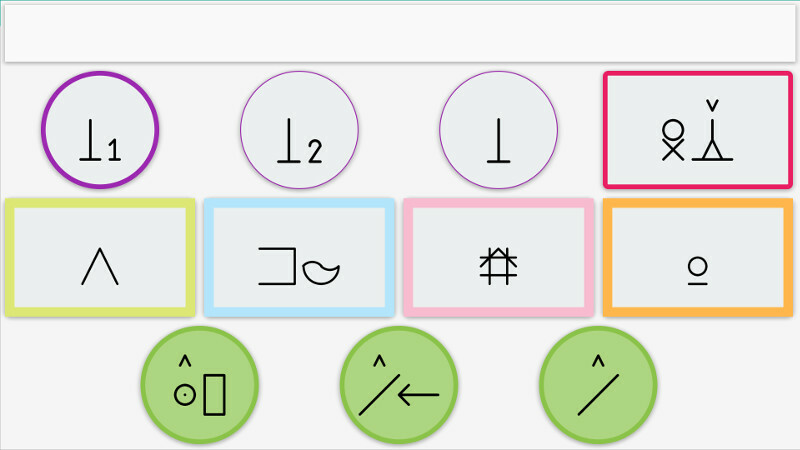 To use an adapted keyboard to express oneself in any situation with total control of the eye tracking system. Searching and identification activity to get used to the new computer access system. It includes 50 levels of increasing dificulty. 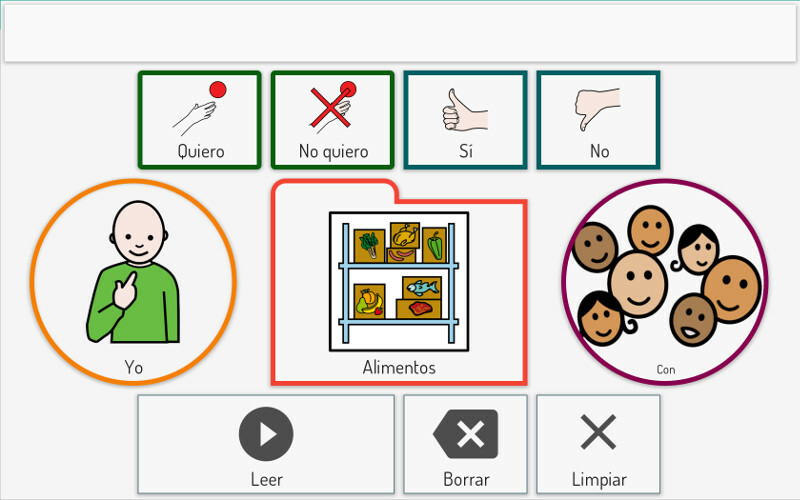 Objectives: Get used to screen accesss, evaluate visual and motor skills and improve the use of the access system. 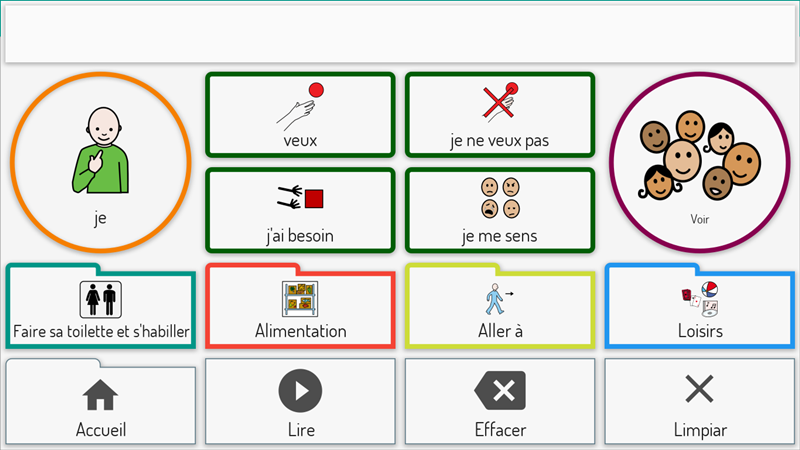 Communication board by literacy with predictive keyboard. 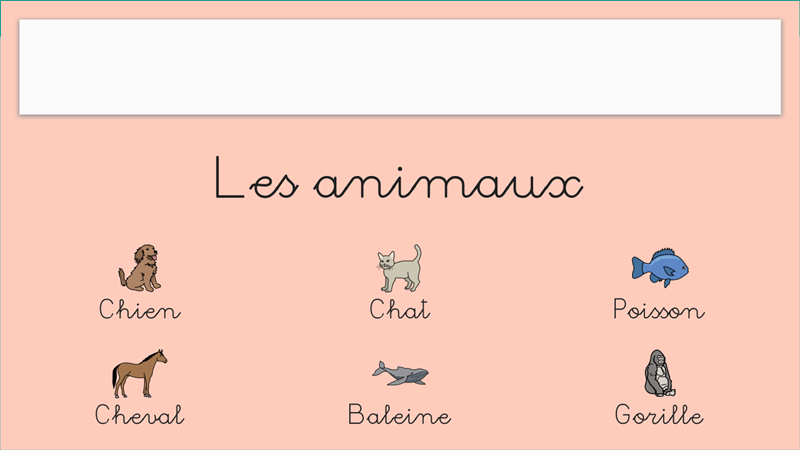 The main page combines some social forms with Arasaac pictograms and a clock. Objectives: Increase expression speed of people by using a predictive keyboard. 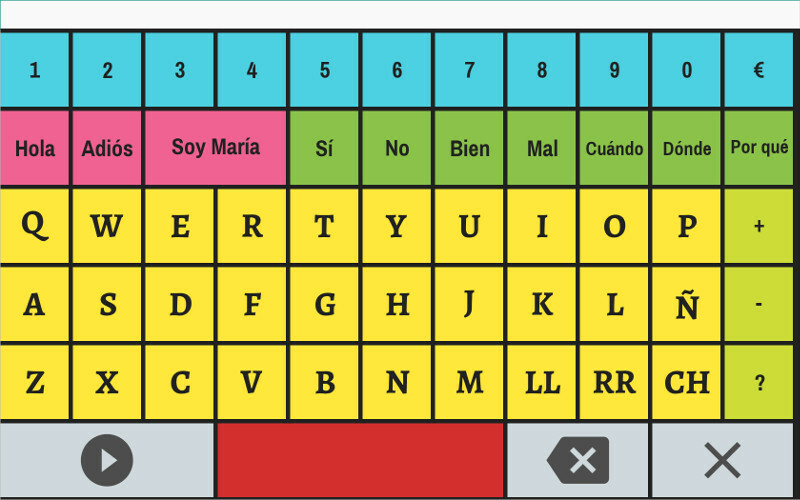 Communication board by literacy with abc predictive keyboard and numerical keyboard. The main page includes some social words and a clock. Objectives: Increase expression speed of people by using an ABC predictive keyboard and numerical keyboard. 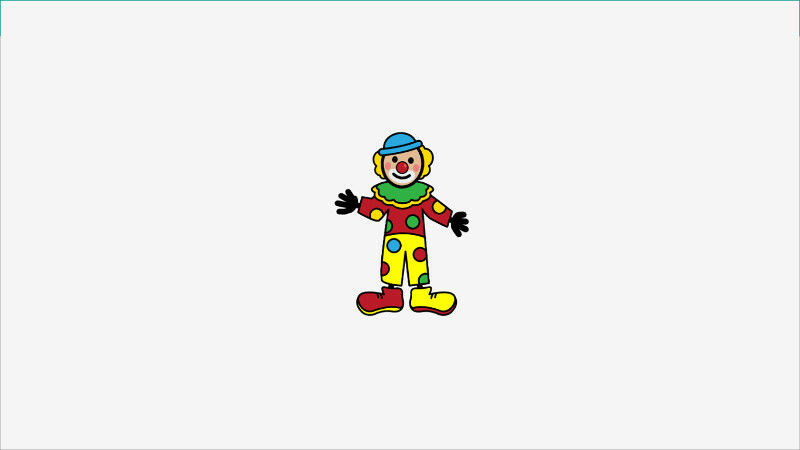 Board designed for children's entertainment with three pages of multimedia offers (videos, songs and photos) with links to launch user-adjustable apps. Objectives: Favour self-determination, promote autonomy and decision making. 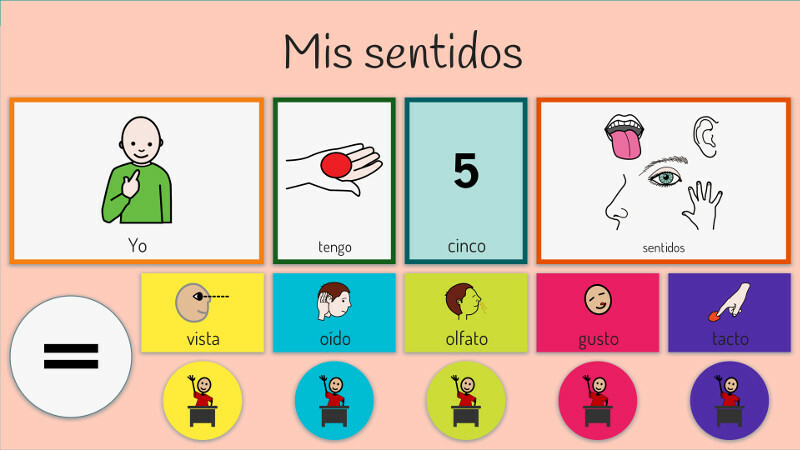 Learning about the five senses in a visual way, with examples of daily activities. It combines symbols and text. Objectives: Recognise five sense organs, understand the visual, taste, smell, vision, hearing, and touch functions and identify daily activities in which intervene. 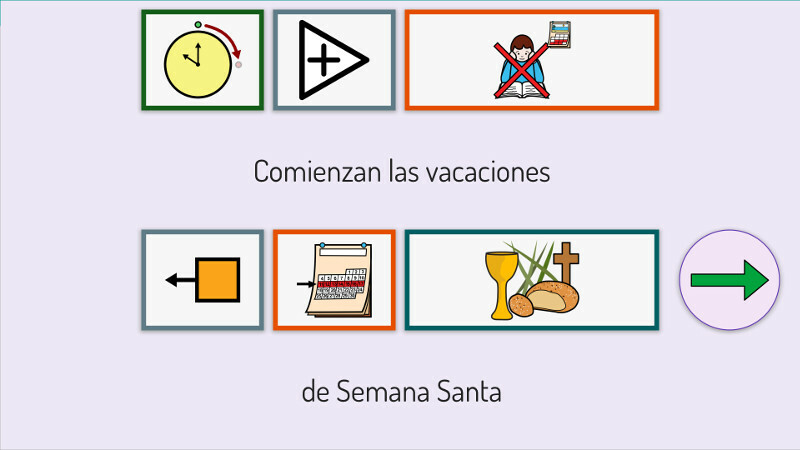 Anticipation board with traditional vocabulary and events of spanish Easter Week. 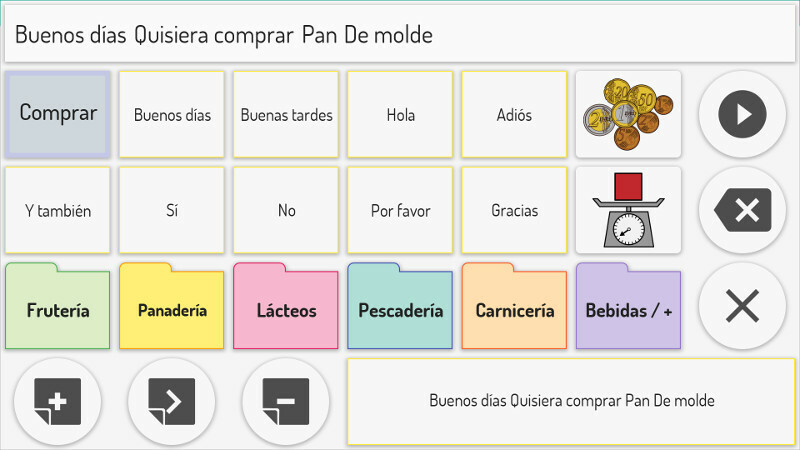 Objectives: Anticipate the common activities in Easter Week, increase self-confident and security feelings, improve the comprehension of socio-behavioural activities and facilitate the adaptation to that context. 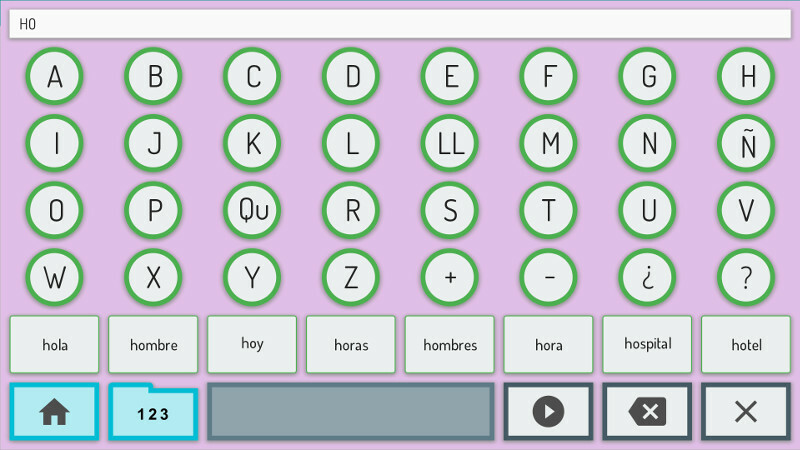 Communication board by literacy with Sarakanda font, a typeface specially designed for dyslexia. The main page includes some common expressions and the access to an abc predictive keyboard and numerical keyboard. 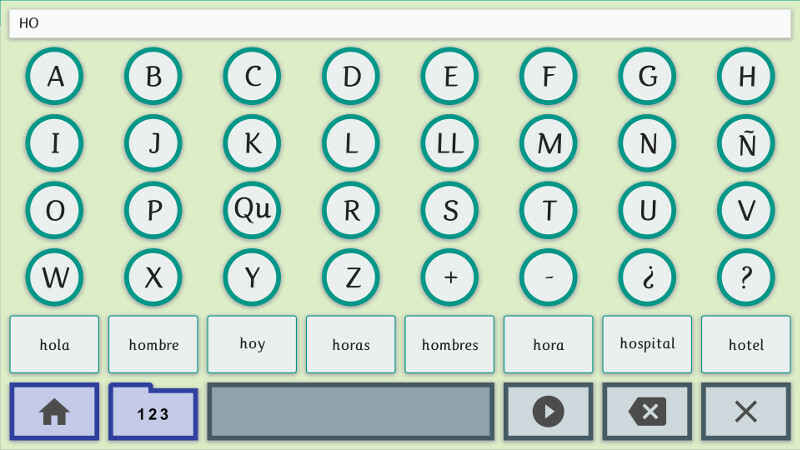 Objectives: Increase expression speed of people with dyslexia by using an ABC predictive keyboard and numerical keyboard. 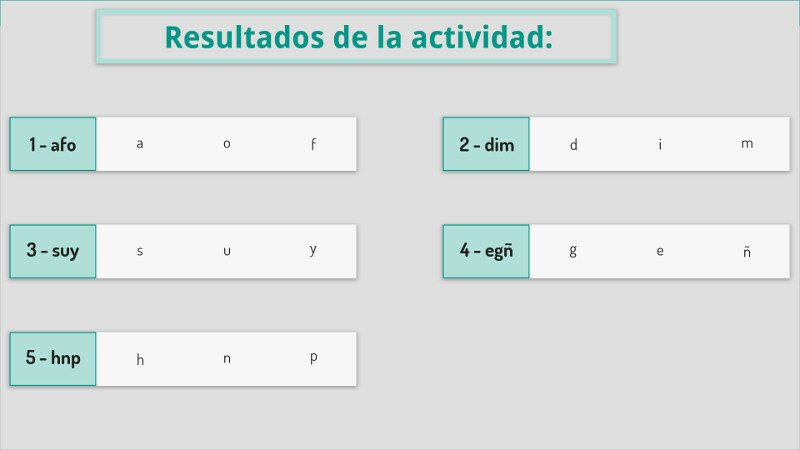 Activity for syntactic analysis initiation. Read each sentence and locate the action in every one. Objectives:Identify verbs, improve reading comprehension and recognise the syntactic nature of each word. Activity to work on emotion skills by visual recognition of real photos. It includes four emotions: happiness, scary, sadness and ire. Objectives: Identify facial expressions, widen emotion vocabulary, strengthen socioemotional skills and understand the link between emotions and daily situations. 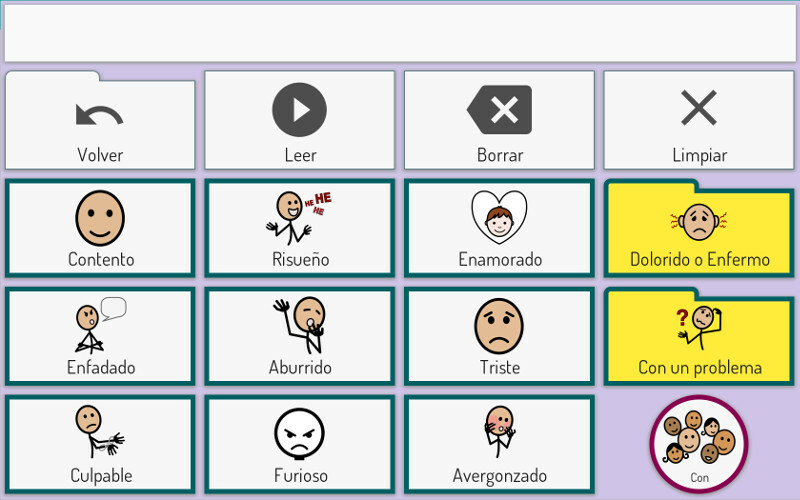 Sample board using the Bliss communication system (English speakers). 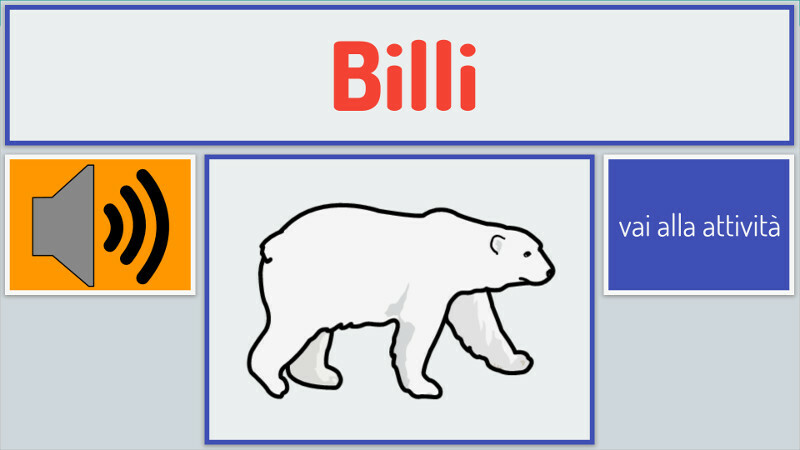 Version of the Compare animales board with Bliss symbols. Objectives: Increase visual perception and improve comprehension skills of Bliss Symbols, foment semantic organization and widen animals vocabulary. Educational activity to find the Bliss symbol that does not fit among the others beacuse of its meaning. Try to find the Bliss symbol you've seen a few seconds ago among all the others. Objectives: Improve searching skills and visual identification of Bliss system, increase attention and visual memory. 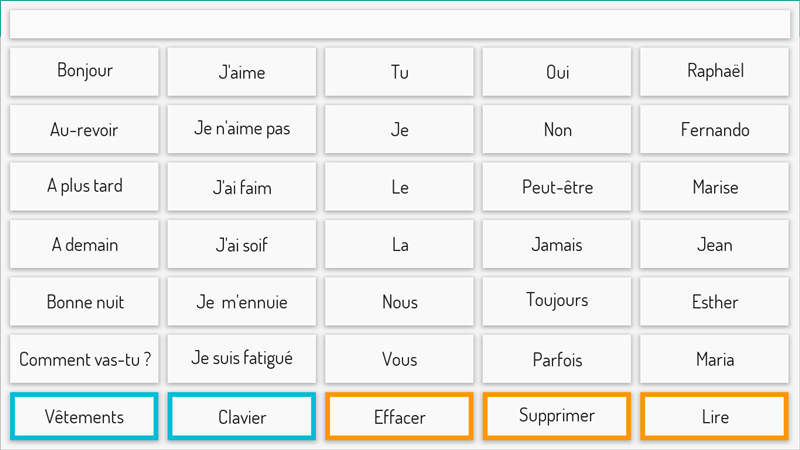 Introduce new Bliss symbols in daily vocabulary. Listen the word and then search the corresponding photo and symbol. 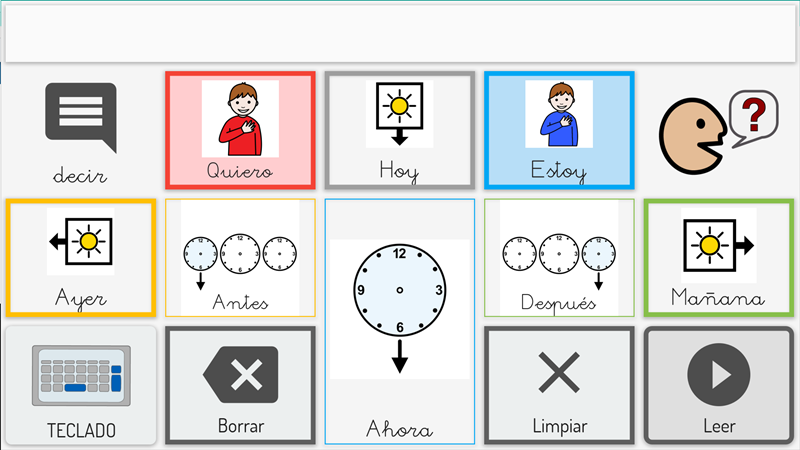 A new basic communication board using images and text (English speakers). 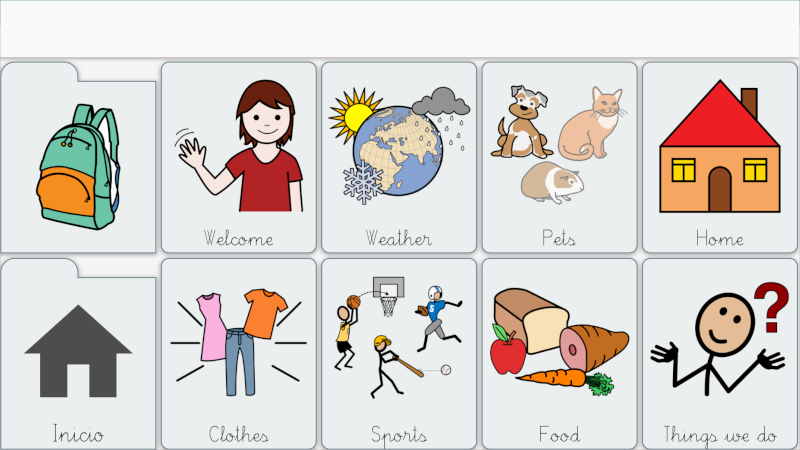 It is designed with two "Home pages" to allow introducing new vocabulary gradually. 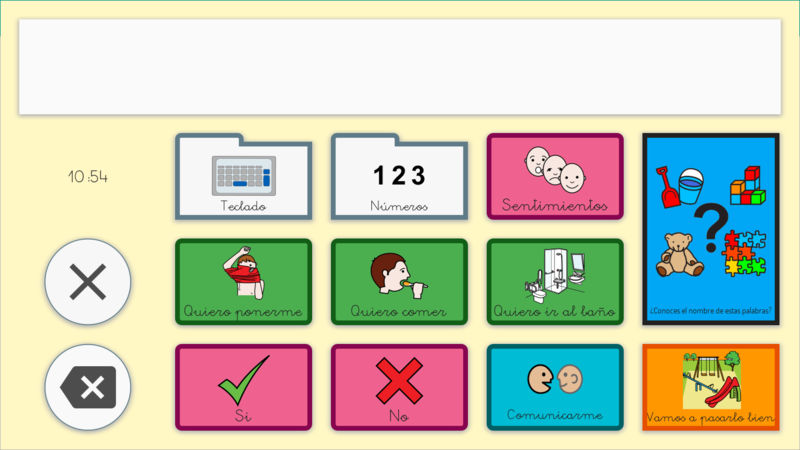 Objectives: Express needs, desires, feelings and daily activities, improve communication and start to use a communication board. 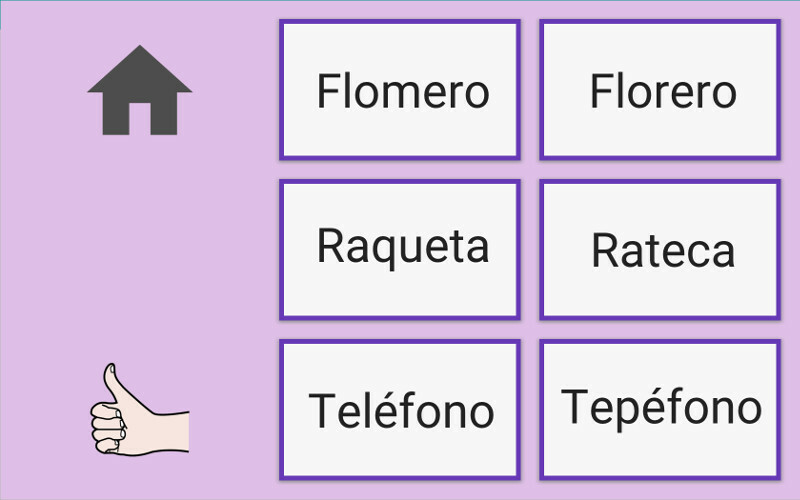 A board with variety of basic conceps (English speakers). 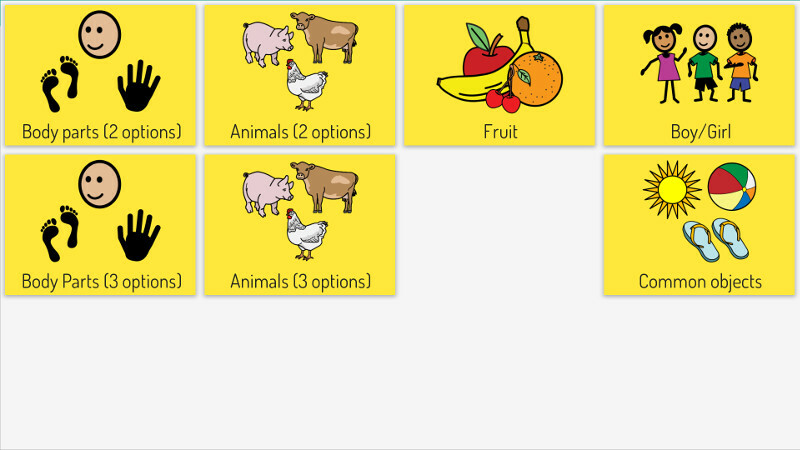 It is organised according to five categories: animals, body parts, objects, boy/girl and fruit. 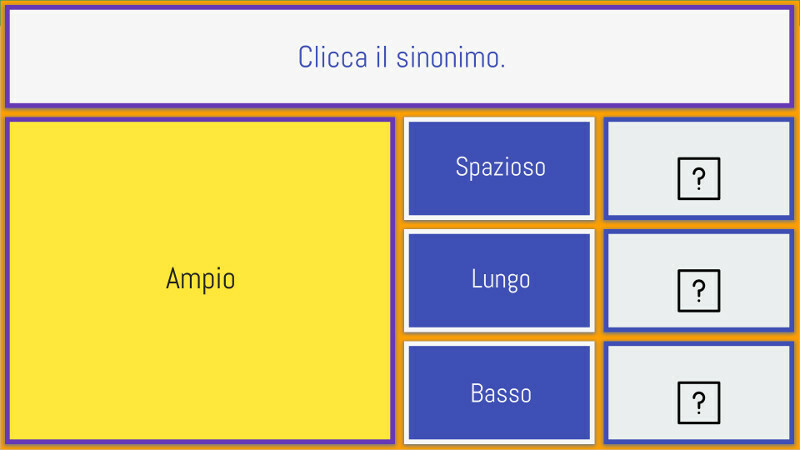 It includes two levels of dificulty (two or three answer options). It is easily expandable with more vocabulary and pages. Objectives: To learn or strengthen basic concepts, play single or group games and start training with computer access systems. Discover the story of Pedro and learn about the hand-washing routine! 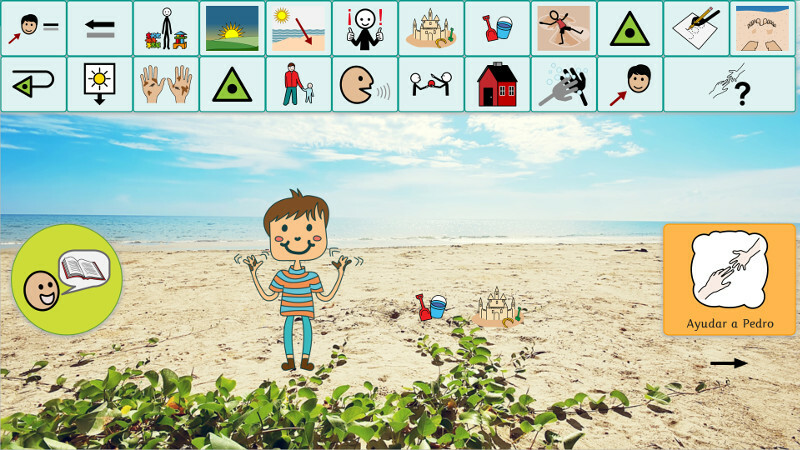 Interactive story aimed to people with autism or children with executive functioning difficulties. 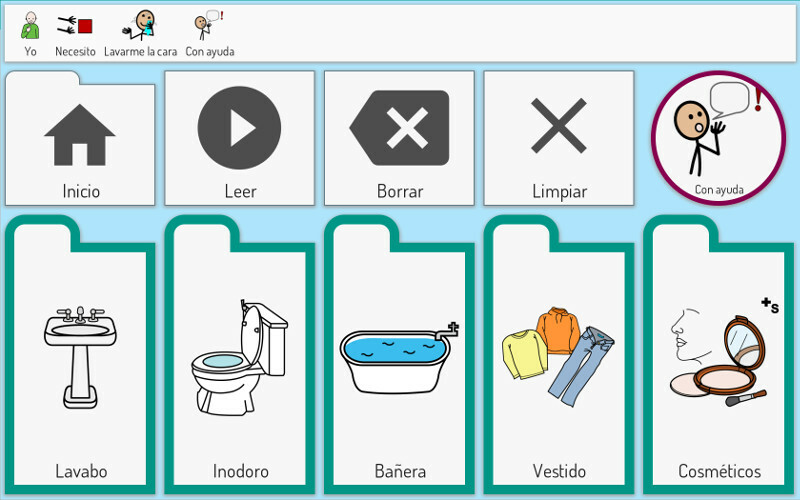 Objectives: To improve planning skills and following directions, understand task sequencing, assimilate hand-washing routine, promote the development of empathy and social competencies through the story characters, etc. Once upon a time there was an orange elephant... 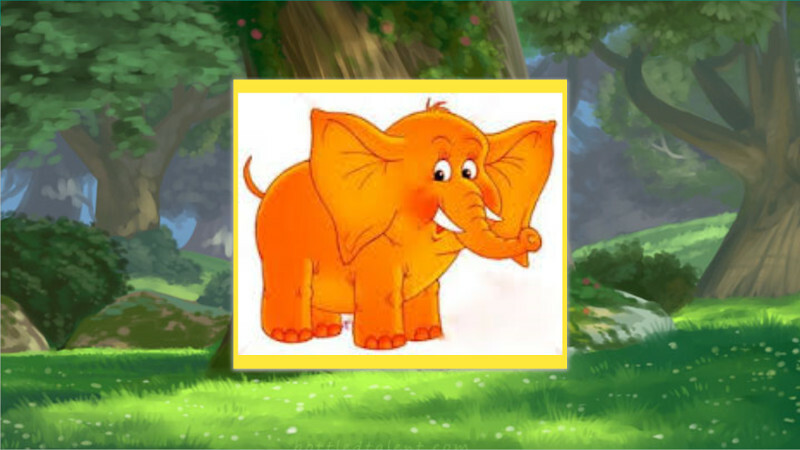 Discover the funny story about the Orange Elephant and add new characters to this interactive tale! It includes some activities at the end. Objectives: To test attention and memory skills, improve comprehension skills and cognitive reasoning, increase the vocabulary and develop imagination. Identification of environmental sounds is the precursor to letter sounds. 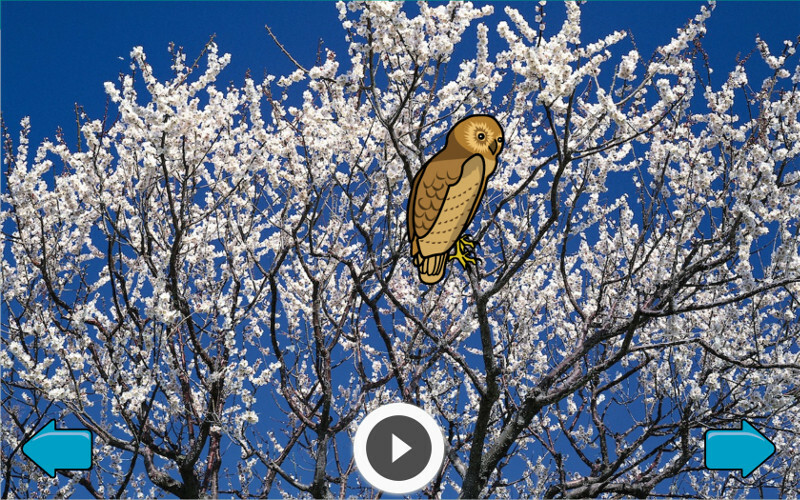 Discover the sound of each animal and recognize it in a basic level. 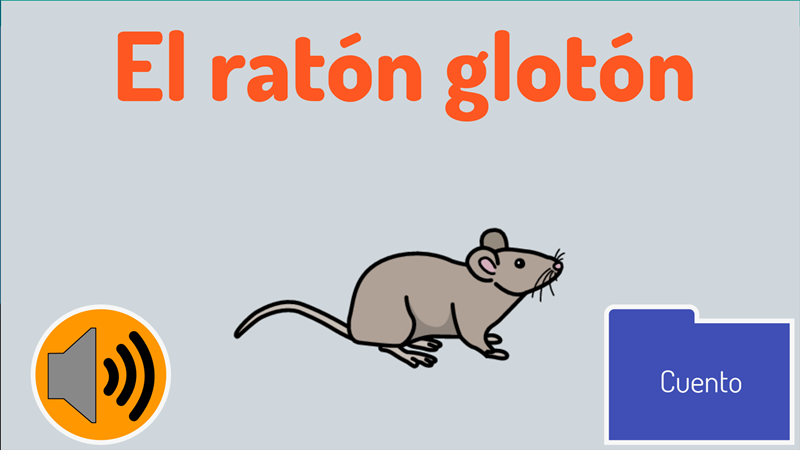 Objectives: To explore enviromental sounds, identify animals sounds, improve auditive attention and concentration, favour active listening process and sound recognition. 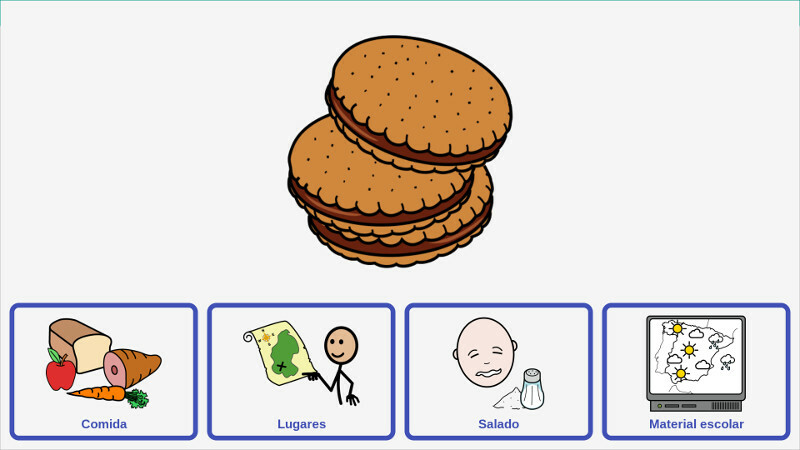 To commemorate International Specific Language Impairment (SLI) Day, today on 30 September we launch this new Verbo Board with four activities designed to improve each aspects: Phonological awareness, semantics, morphosyntactic and pragmatic. 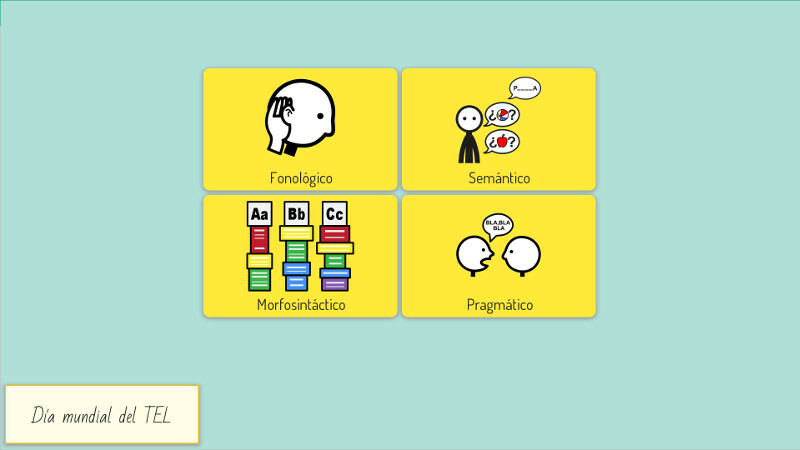 Objectives: To bring new resources for people with language difficulties. Discover the most horrific scenes in this game. Turn up the volume and save the scary child from monsters. 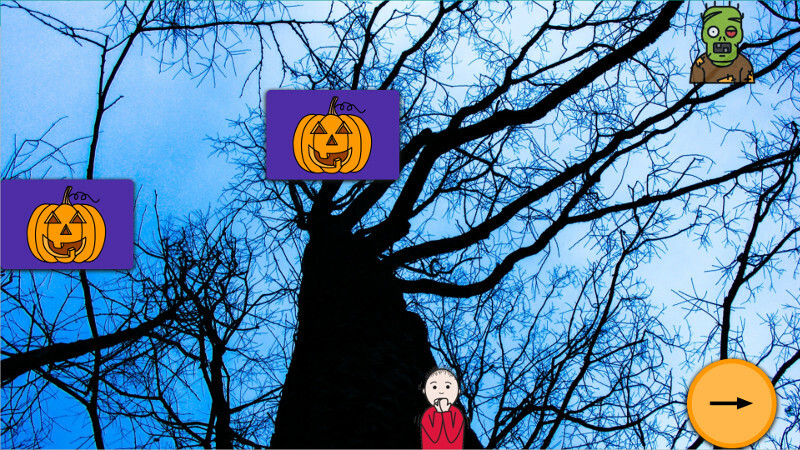 Objectives: Get used to screen access, improve memory, enhance motivation with Halloween theme, and use terror thematic in socio-emotional interventions or anticipation. 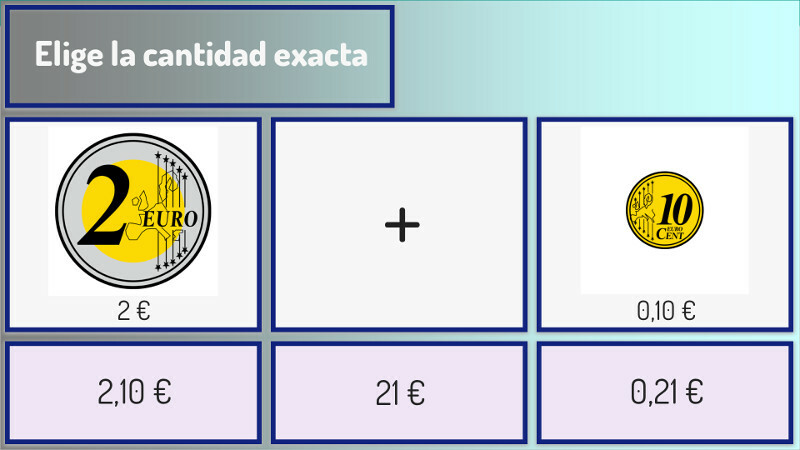 With this activity you will learn to do additions of amounts of money with euro cents and coins. Objectives: Improve the addition of decimal numbers, working on mathematical reasoning, memory and attention skills, and enhance the choice between three options. Shared by: Massimo Benelli. Traducido por Eneso. 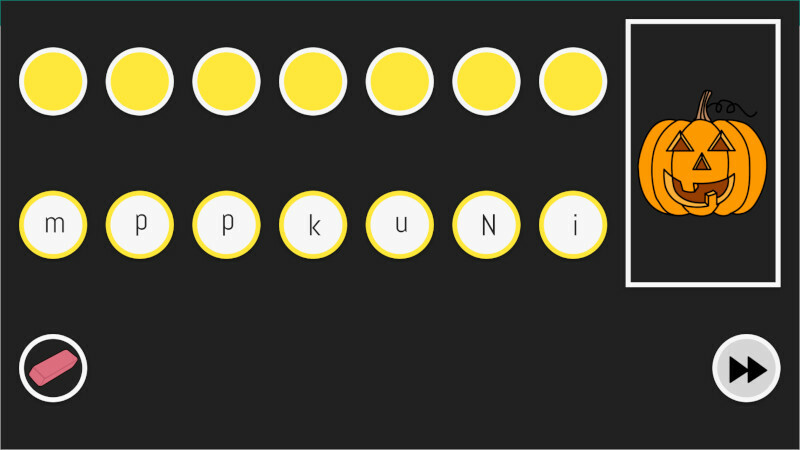 Simple and visual communication board with big cells. It is perfect for first steps with a communication board and you can use it with any access system. It is designed with symbols and no text in AAC style. Objectives: To communicate food, toilet and free time needs in relation to the social context. 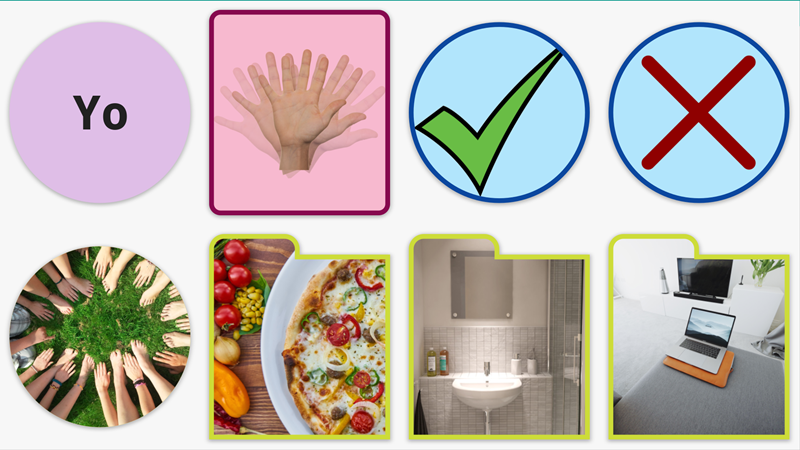 Simple real pictures recognition activity. Listen carefully the instruction and select the correct real picture between three options. It's ideal for training with switches or eye tracking systems. Objectives: Improve your vocabulary, identify semantic categories, strengthen logical reasoning and transition between real pictures and symbols. Guess who? Activity to learn about your family members and their connections. 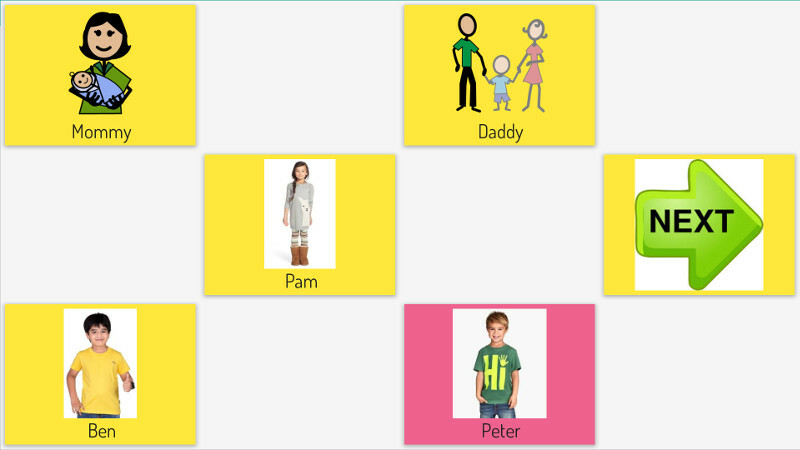 Change the symbols for real pictures of your family and start the game! 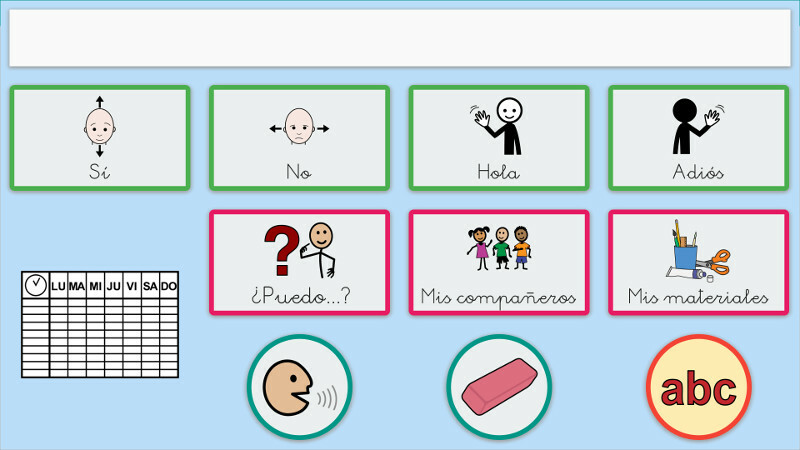 Communication board for the school environment that uses pictograms and calligraphic font with the AAC Outline style. 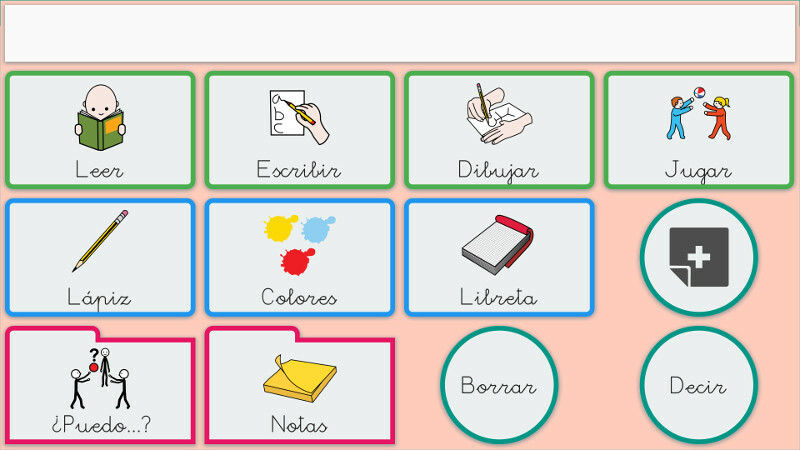 It includes a timetable, a page witgh actions, names of classmates and materiales. It also includes a predictive keyboard for children. Objectives: Express oneself, sequence tasks, ask questions, communicate needs and improve the relationship with peers. 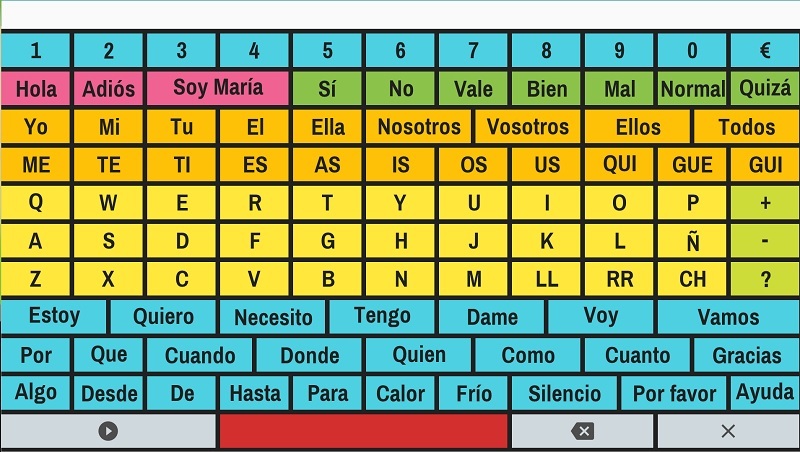 Colourful predictive keyboard. Objectives: Increase expression speed of people who use literacy. 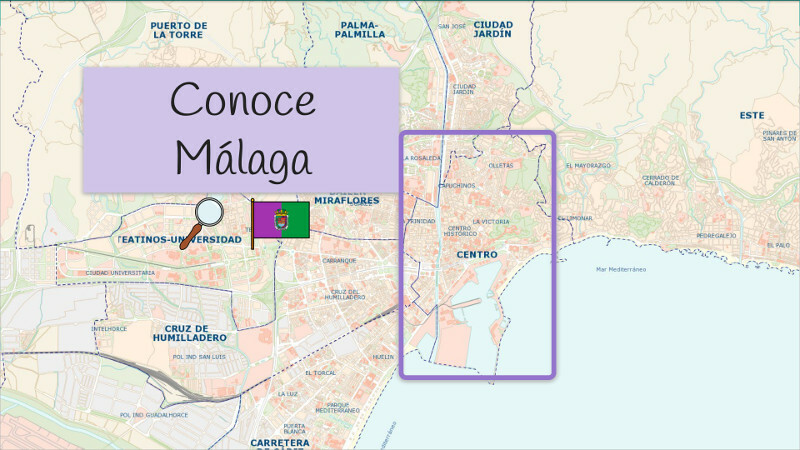 A walk through the most popular areas of Malaga (Andalussia). 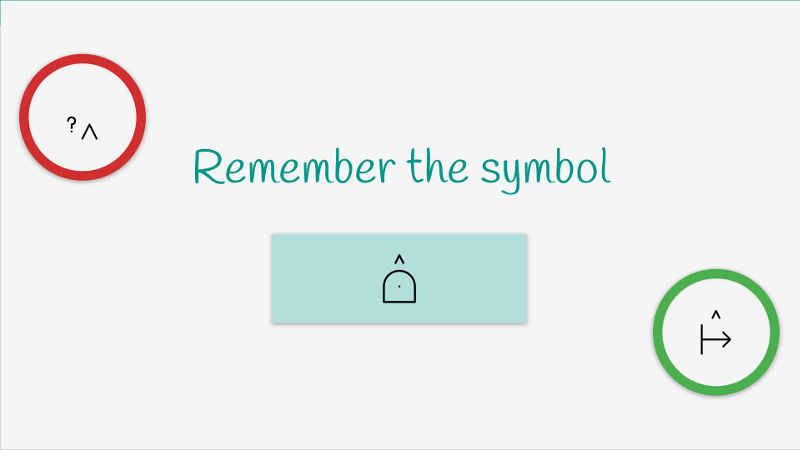 Discover the museums, historic buildings, and the best-known squares of this beautiful city with this accesible board designed with symbols and text. 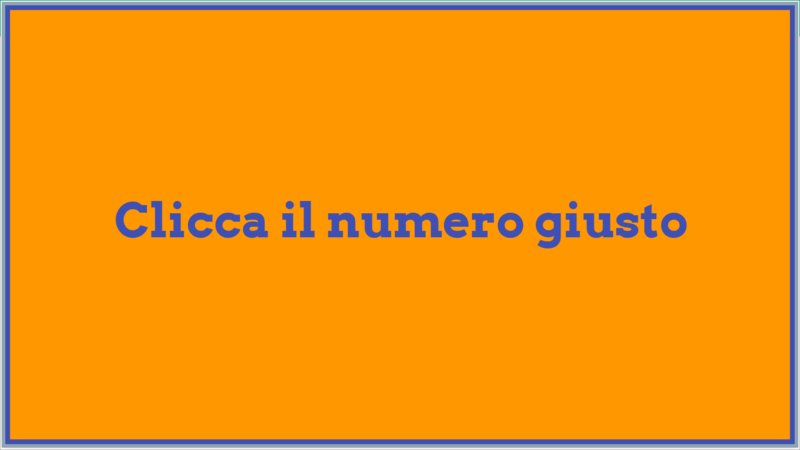 Semplice attivitÃ di matematica a risposta multipla. Cause and effect activity to get used to the new computer access system. 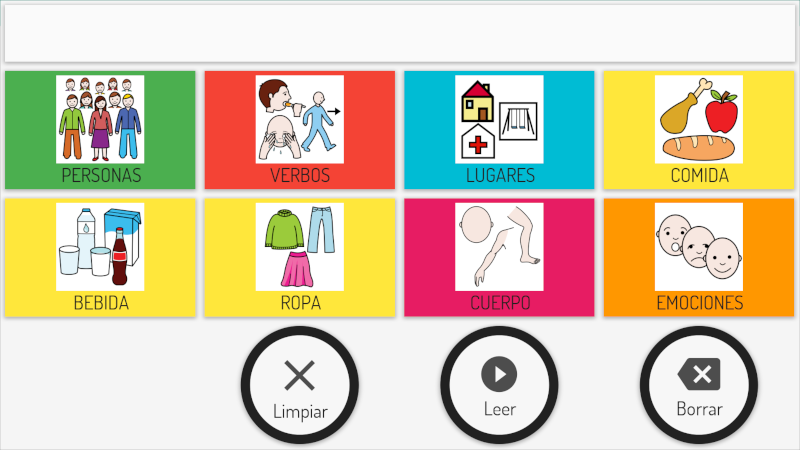 Objectives: Get used to screen accesss, evaluate visual and motor skills and improve the use of switch in Eneso Verbo. A personal board with variety of basic conceps. It is easily expandable with more vocabulary and pages. 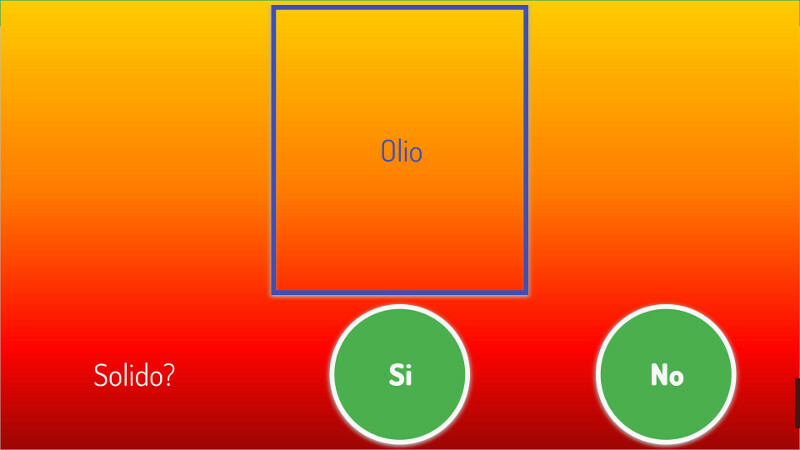 I quaderno (in italiano) sulla scelta del miglior aggettivo per una parola. 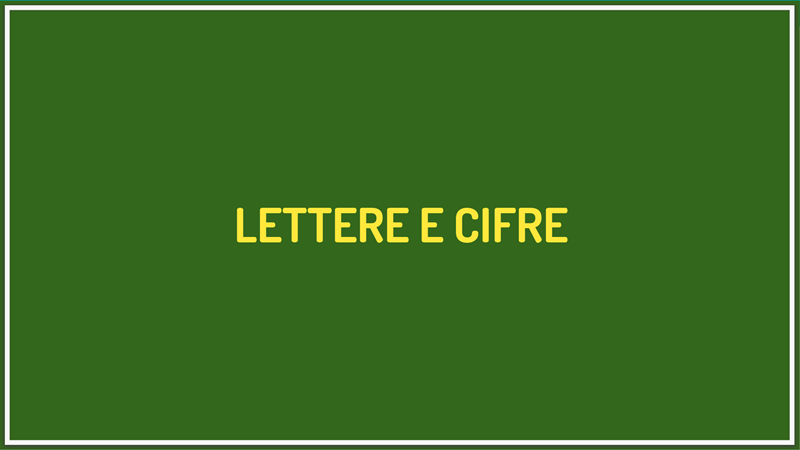 Obiettivi: migliorare la comprensione aggetive semantiche. 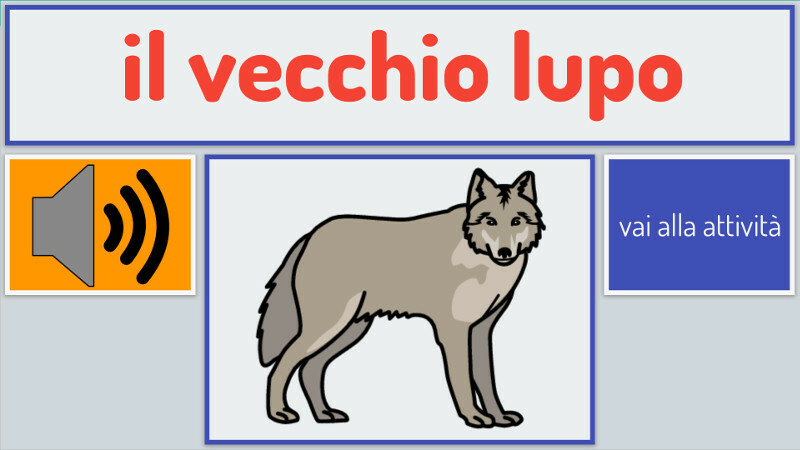 Semplice esercizio di comprensione testo con rispose multiple stesso genere esercizi precedenti (topo goloso, vecchio lupo). 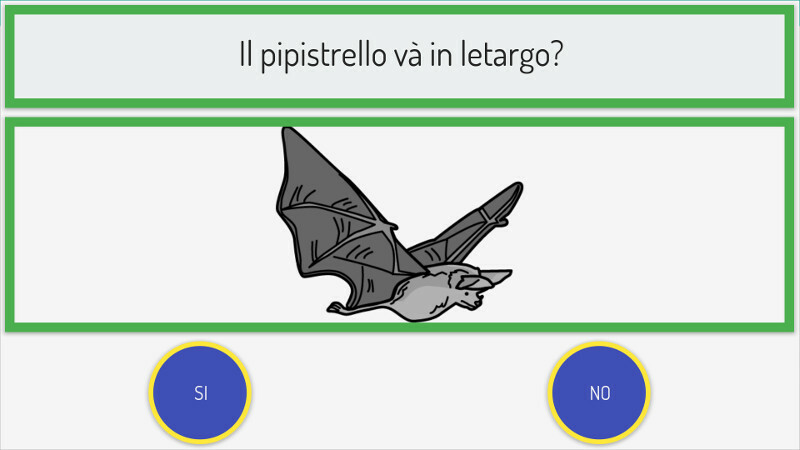 AttivitÃ didattica (in italiano). Scegliere la modalitÃ di trasporto che soddisfi lo slogan data. E 'ecologico? Va sotto il mare? Obiettivi: per imparare le caratteristiche e le differenze dei vari mezzi di trasporto, migliorare l'attenzione al compito e lavoro la scelta tra tre alternative . 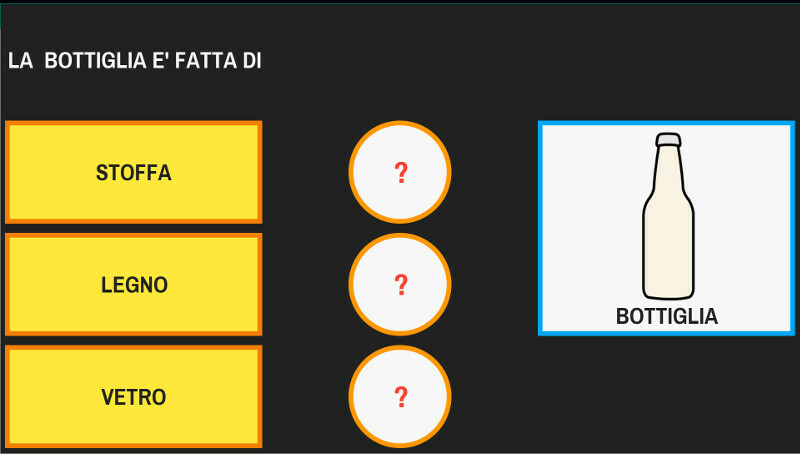 Activity board (in Italian) of questions answers yes / no. 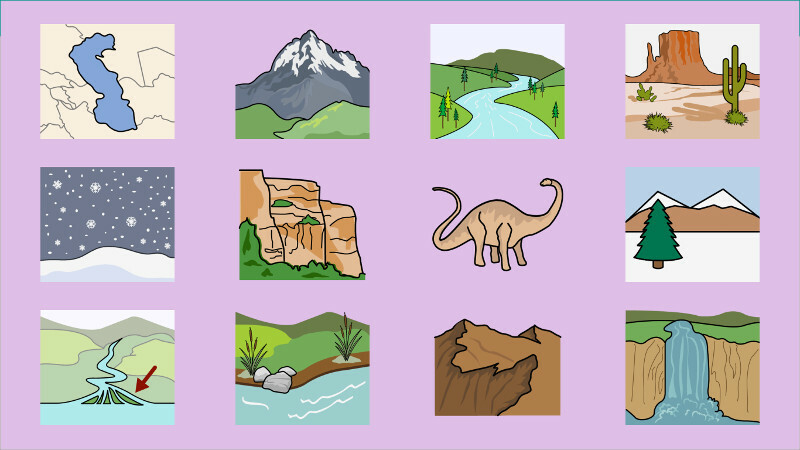 You have to select if the represented animal hibernates or if it migrates. 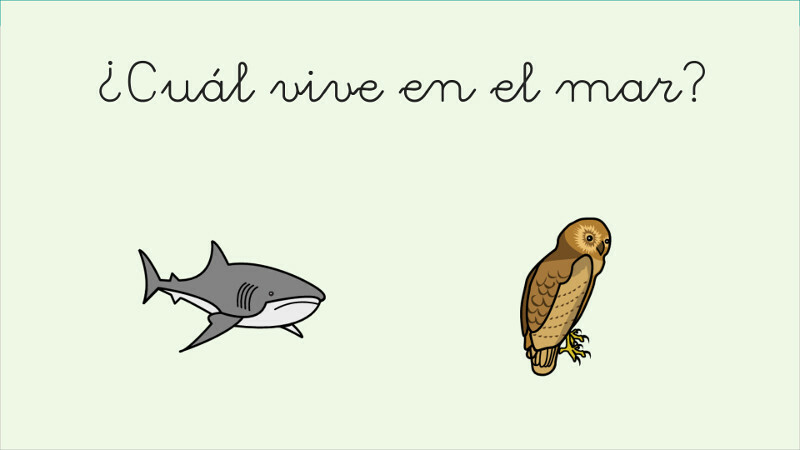 Objectives: To learn which animals hibernate or migrate, to enhance the memory and to work in the selection of answers with the corresponding access form. 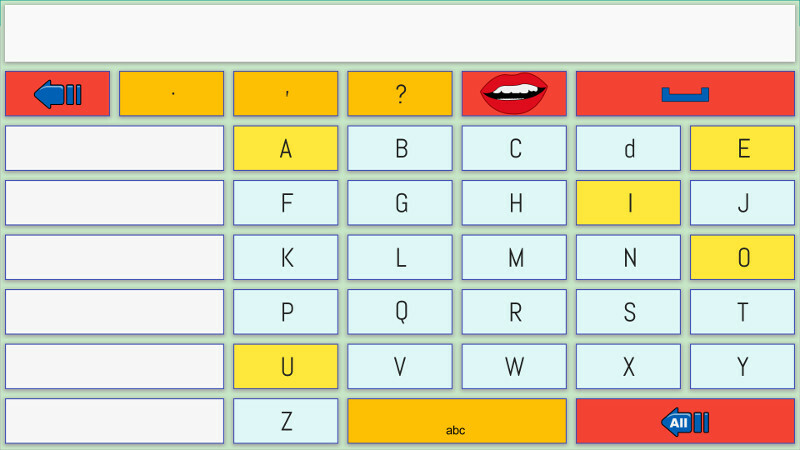 Alphabet and syllabic keyboard that includes several pages of categories with a high contrast color combination. 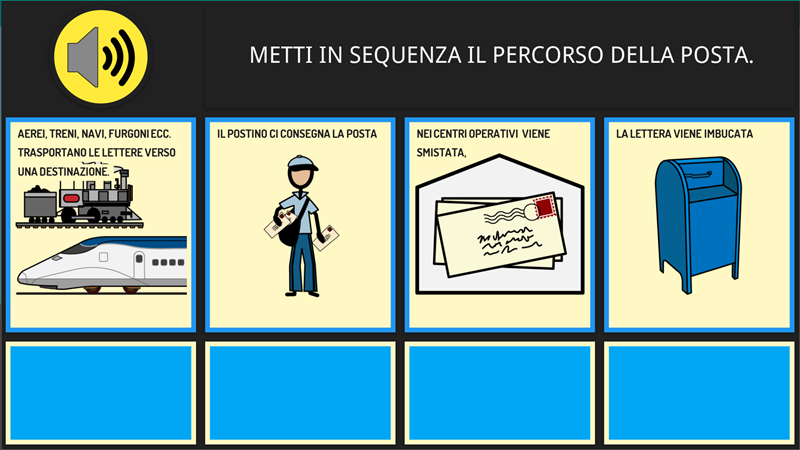 Activity board (in Italian). Choose the corresponding synonym for a word. 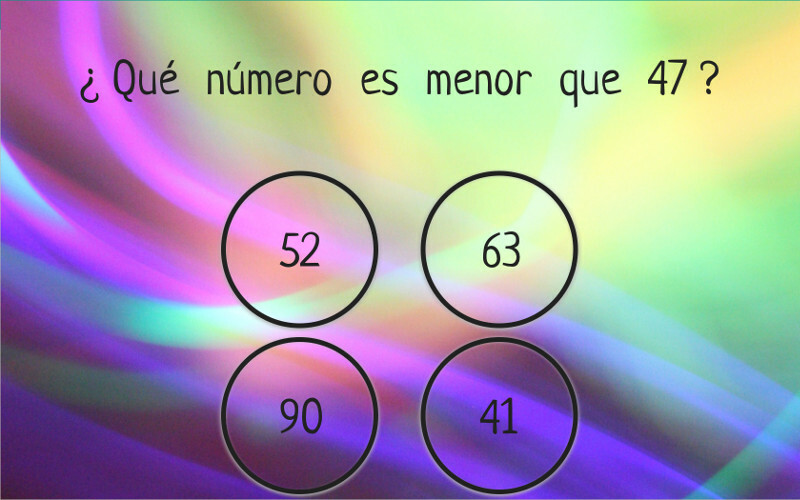 Read the number written in letters and choose its corresponding digit. Objectives: To work on maths reasoning skills, understand the meaning of numbers and improve the selection between different alternatives. Communication board with photos. Perfect for people who don't use neither symbols nor literacy for communication. You can replace sample pictures for your own photos. Objectives: To get initiated in the use of a communication board to express basic needs in activities of daily living like eating, bathing and leisure participation. 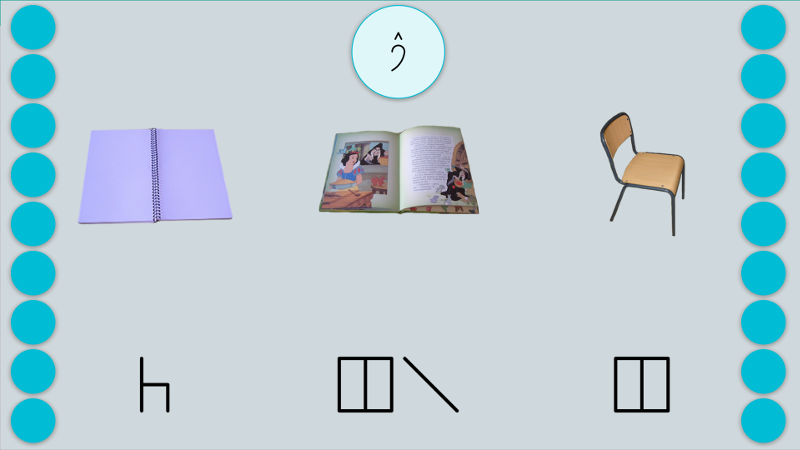 Check the images and choose the corresponding vowel. 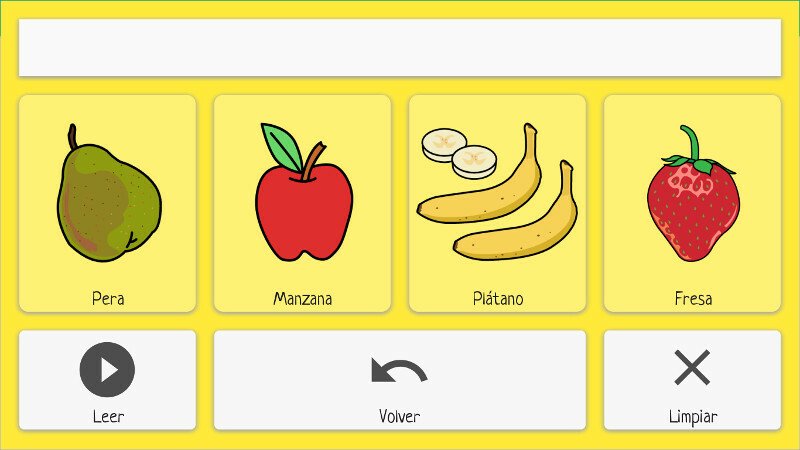 Objectives: Learn about vowels sounds, work on the representation of phonemes and practice vocalizations. Explore relationships between words and its categories. 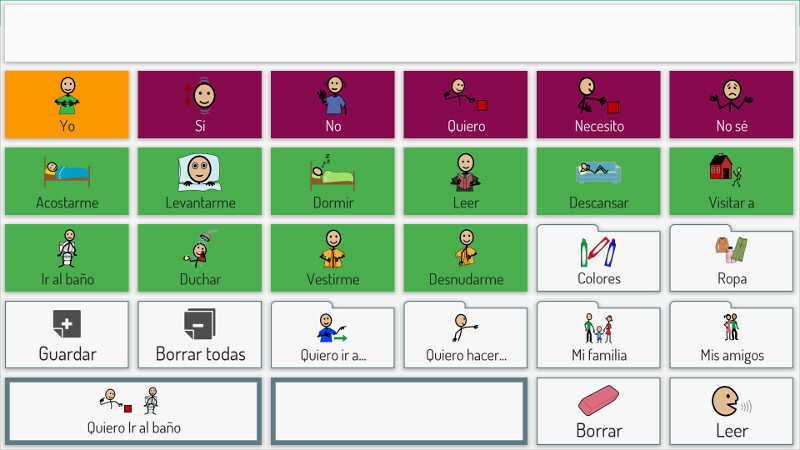 Objectives: Improve the use of aac, increase vocabulary and select between 4 options. Count the objects to see how many actually are in the image. Objectives: to learn about quantities and maths concepts. 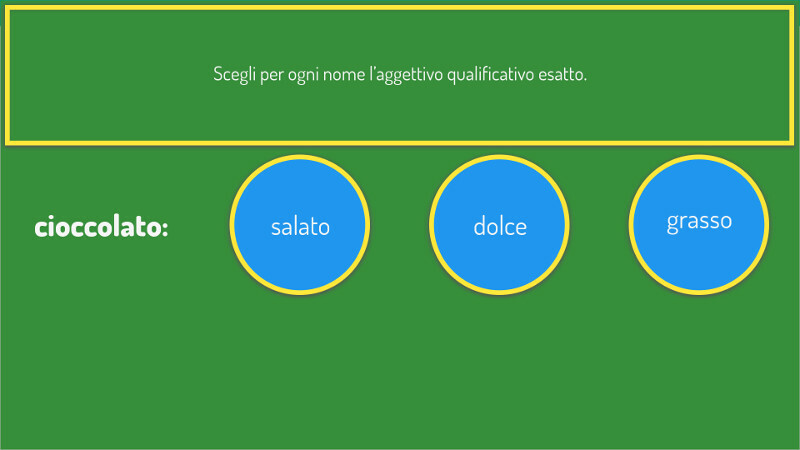 Select the best qualifying adjectives for each word. 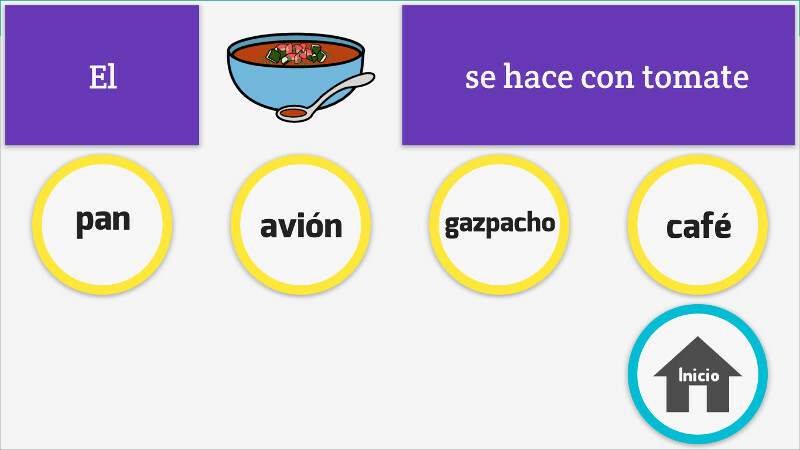 Objectives: Learn about the meaning of different qualifying adjectives for building vocabulary. How many ladybugs are there? Many ladybugs, few one or none. Objectives: To learn about the notion of quantity, improve the vocabulary and work on maths concepts. A tale about a little mouse in trouble. Read or listen the tale and do the activities related. Objectives: Work on listening and reading comprehension, imrpove memory and attention skills. Italian Board to answer different questions about means of transport. 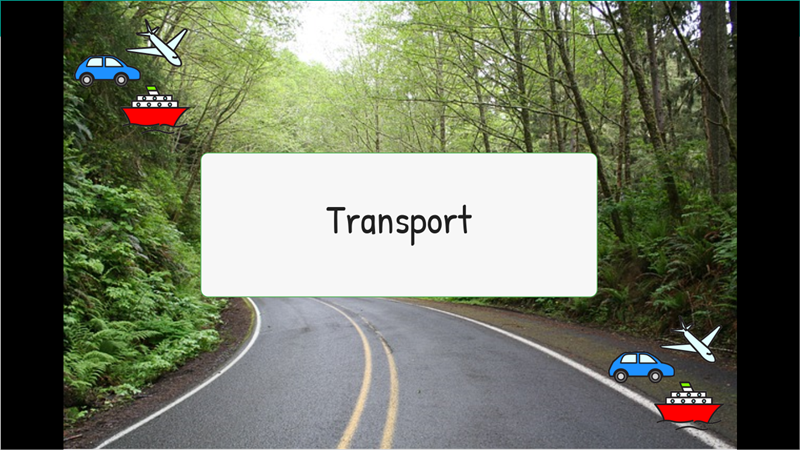 Objectives: Work on logical reasoning about means of transport in our society. 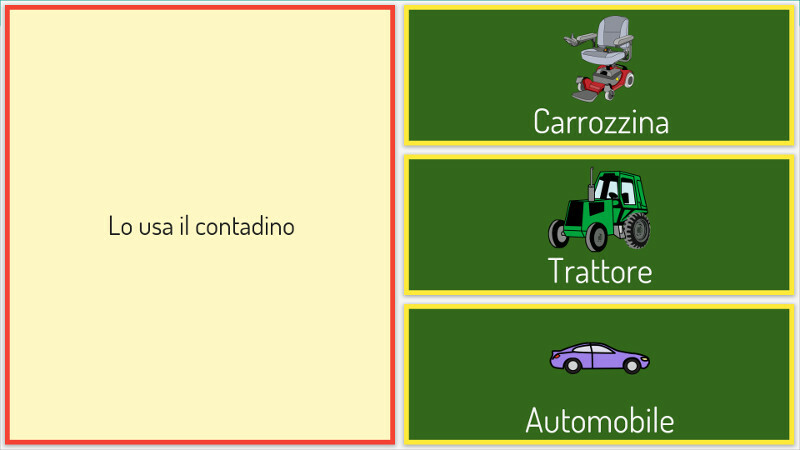 Identify traffic signals and learn about their meaning (in italian). Objectives: Learn the meaning of traffic signs and encourage civic education. 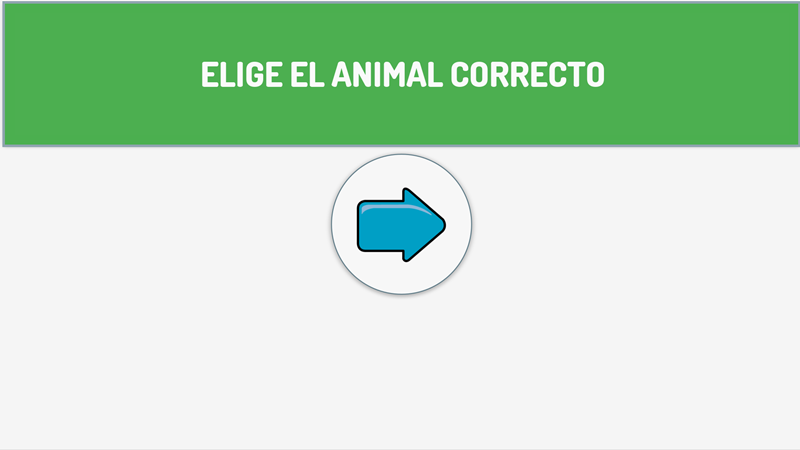 Select the animal according to the question of each level. 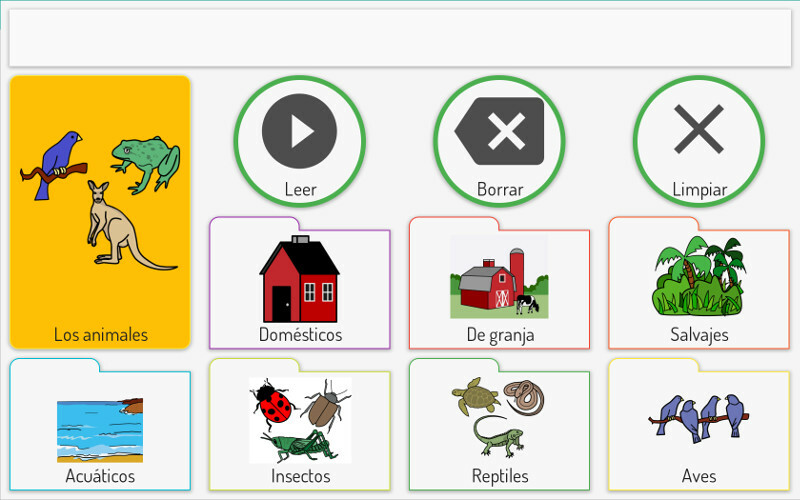 Objectives: improve listening and reading attention, logical reasoning and vocabulary comprehension about animals. Shared by: Ãngeles Gil. Creado en el curso nivel III de Verbo. 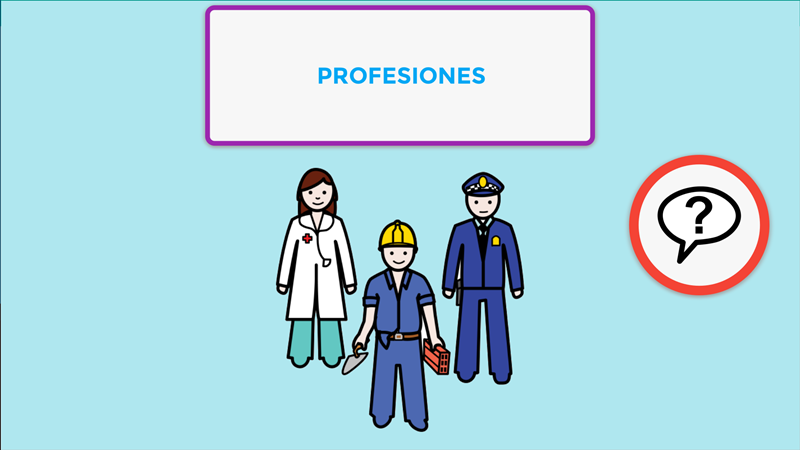 Look at the picture and choose the appropriate profession. 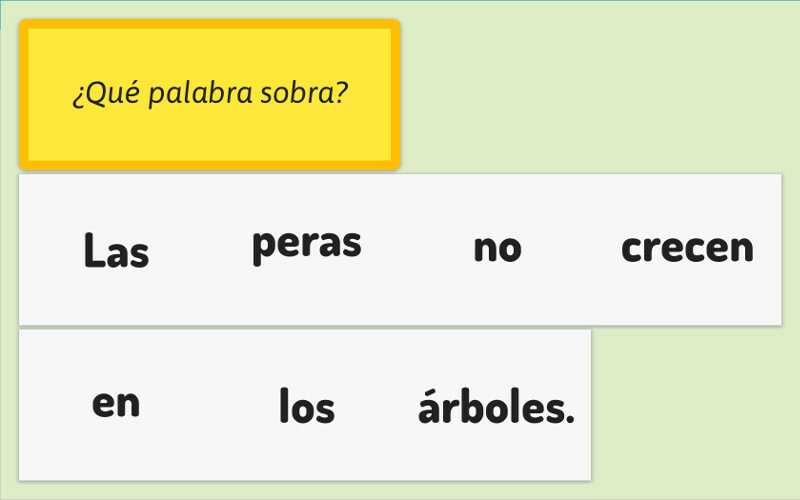 Objectives: increase vocabulary of different professions and work on the selection between four different answers with the required access system. Shared by: Raquel (Amappace). Creado en el curso nivel III de Verbo. Which animal is missing? 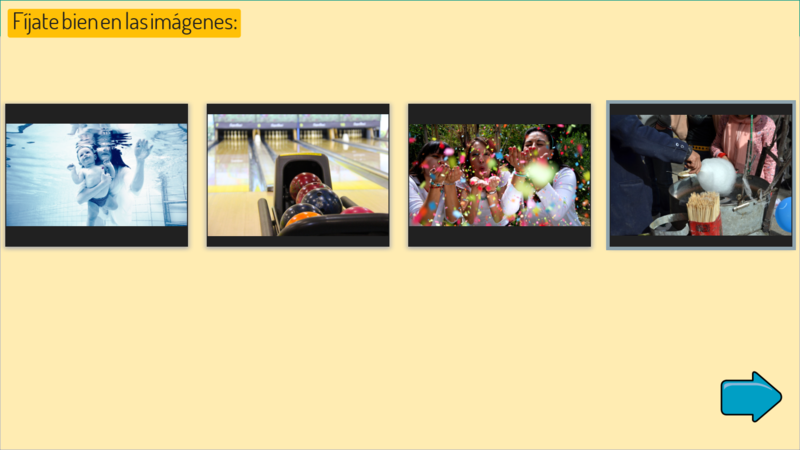 Remember de images and select de one missed. 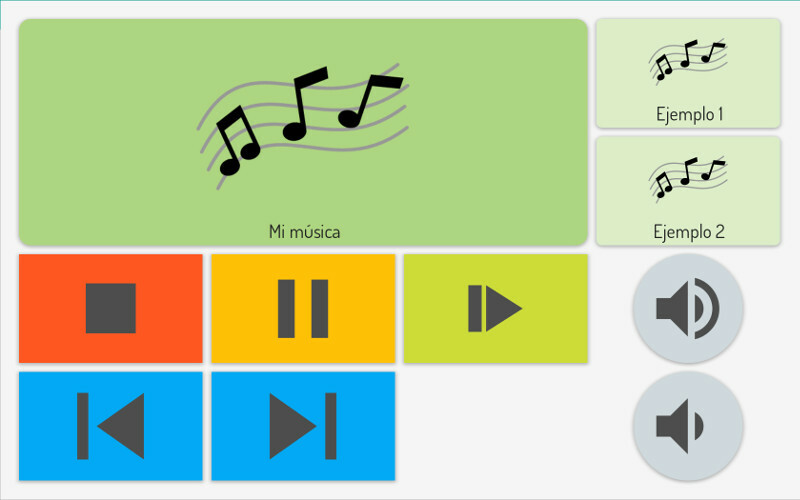 Board with real sounds as reinforcement. Objectives: improve visual attention, concentration and memory. Shared by: Leticia (Amappace). Creado en el curso nivel III de Verbo. 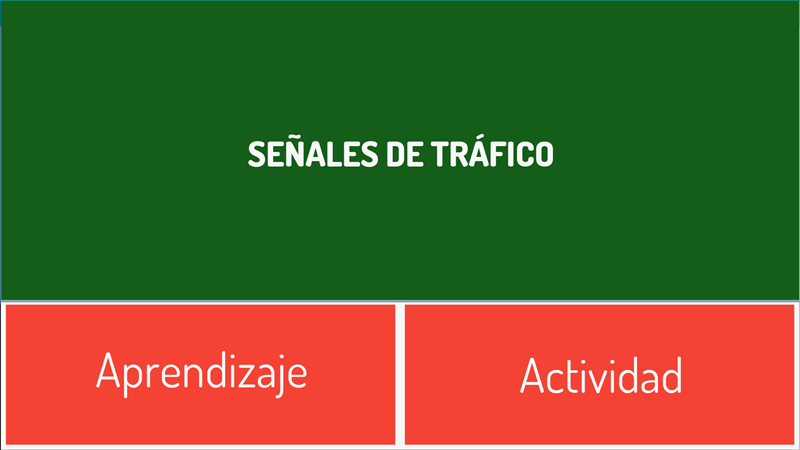 Identify traffic signals and learn about their meaning. Order the images according to the logical time of appearance in each story. Objectives: work on logical reasoning about time sequencing of stories, increase vocabulary and improve attention and memory skills. 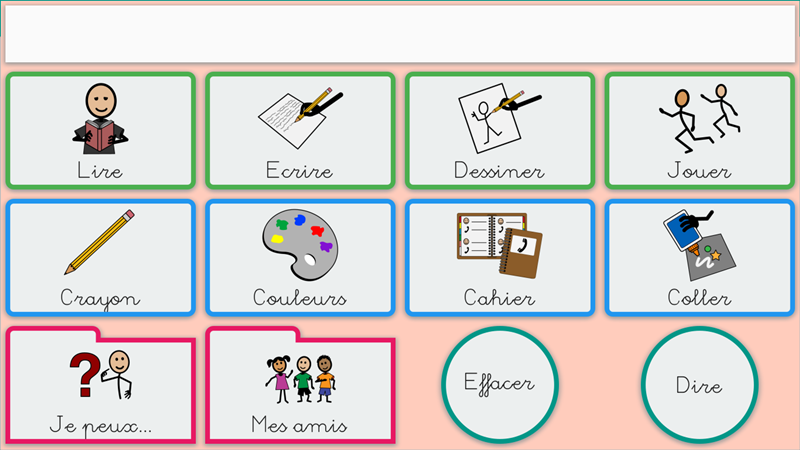 Comunication board for children. It is created with pictograms and calligraphic letters. 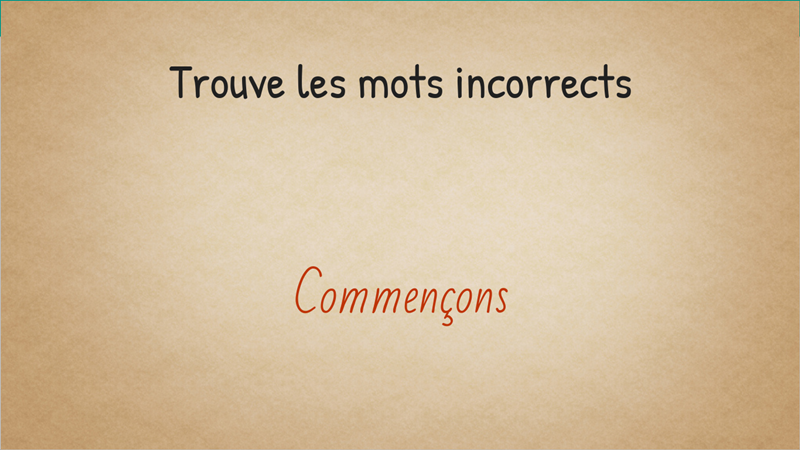 Objectives: create sentences to communicate. Questions, answers, tell experiences, express emotions, requests and several learnings (colors, days of the week ...). 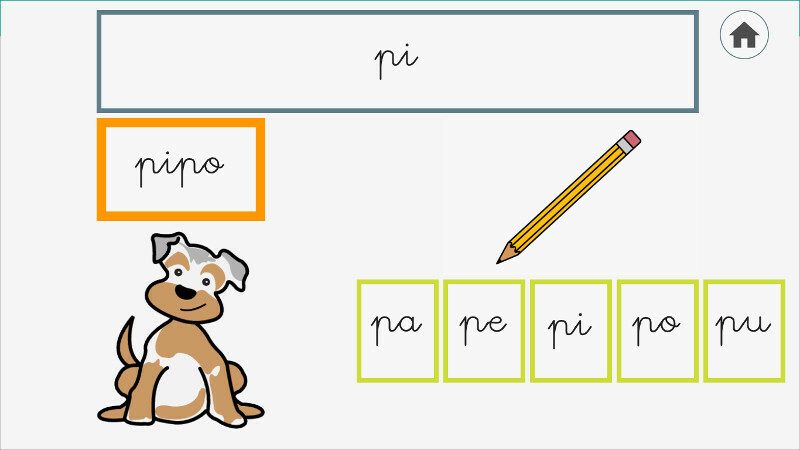 Match the displayed image to its name, activity with letter P.
Match the displayed image to its name, activity with letters P and M.
Match the displayed image to its name, activity with letters P, M and S.
(In italian language). Order the images according to the logical time of happen in the mail sequence. Select the correct animal according to the asked question. Searching and identification activity to get used to the new computer access system. It includes several levels of increasing dificulty. 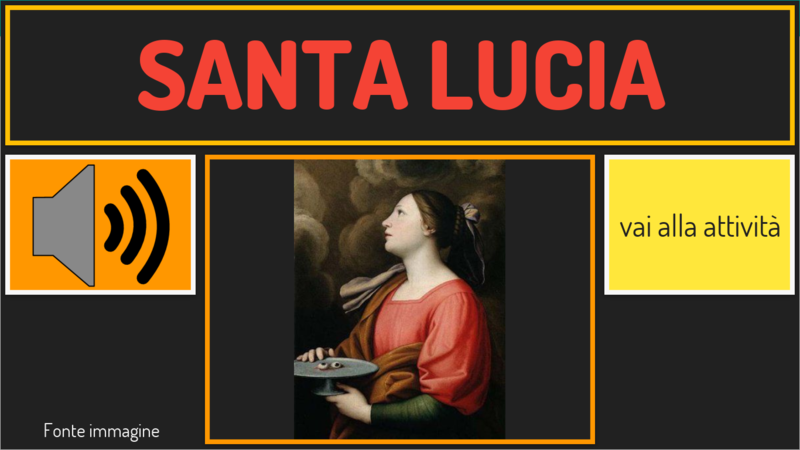 Learn about Lucy's feast on 13 December (in italian). How many ... are there? 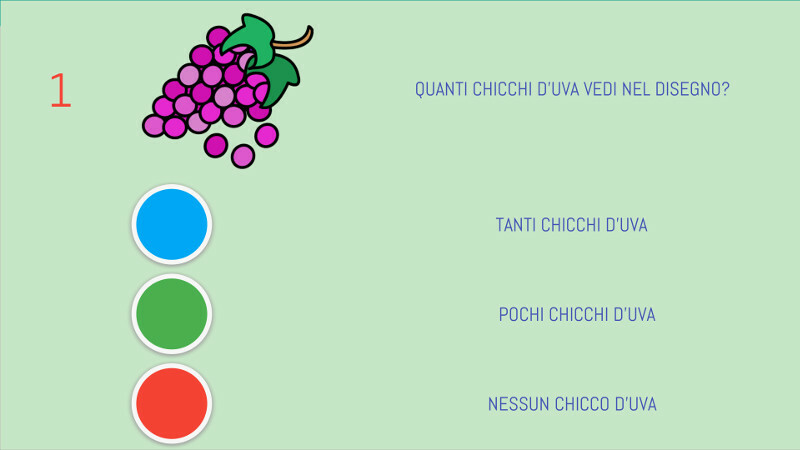 Activity board in Italian language to select the corresponding amount. 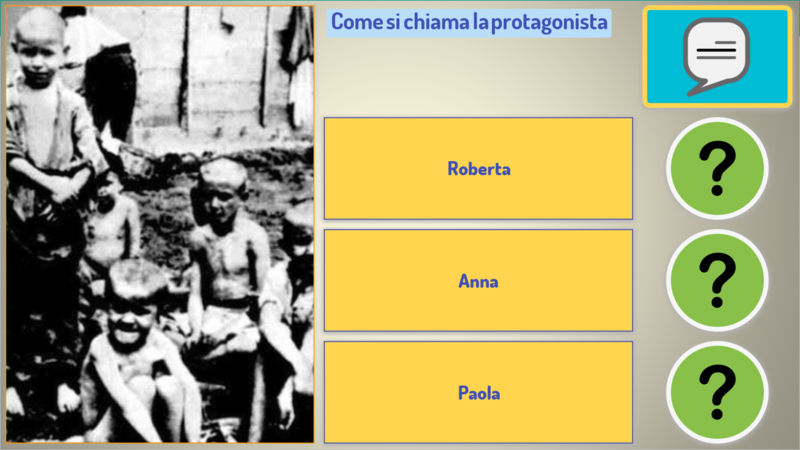 Activity to learn the story of Anna Frank with questions and answers (in Italian). Objectives: Learn aboyt Anna Frank' story. 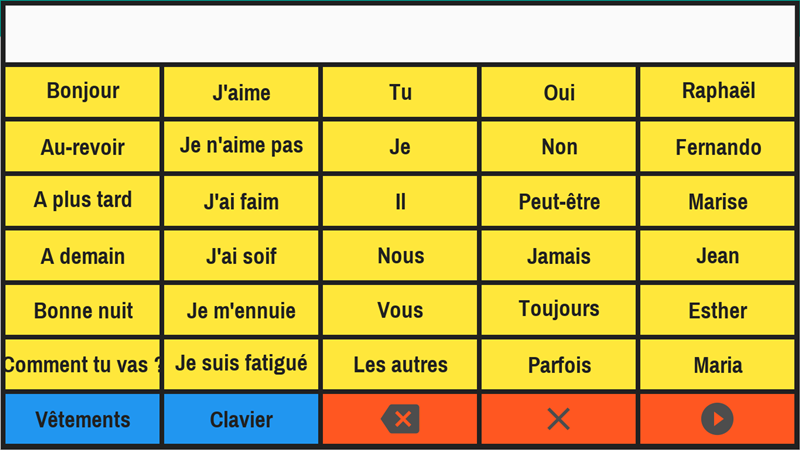 Learn colors and play to select the one indicated. 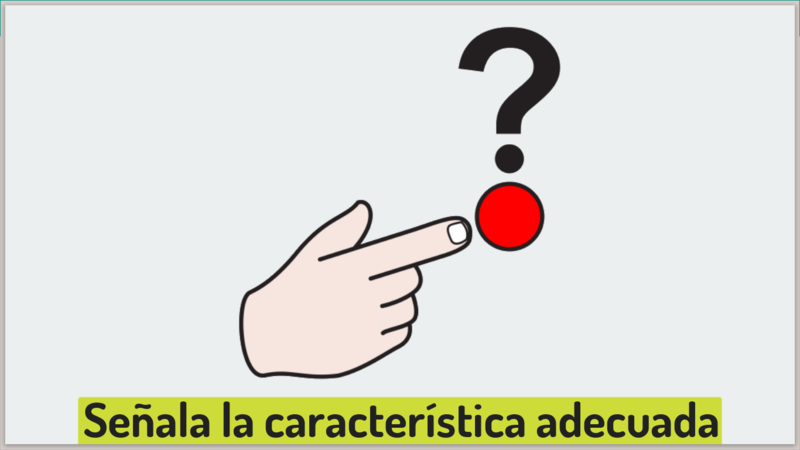 Objectives: recognize colors, identify objects with colors and choose the answer between four options. Choose the most representative characteristic of the following concepts. 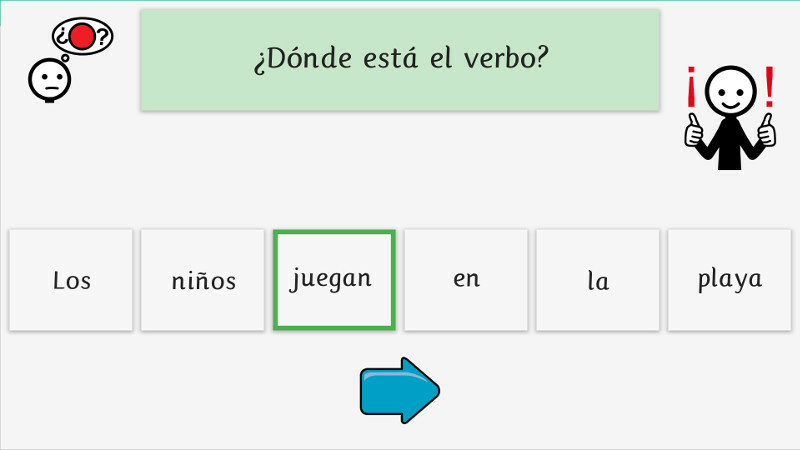 Objectives: learn new vocabulary, identify new adjectives and work on the opposites. 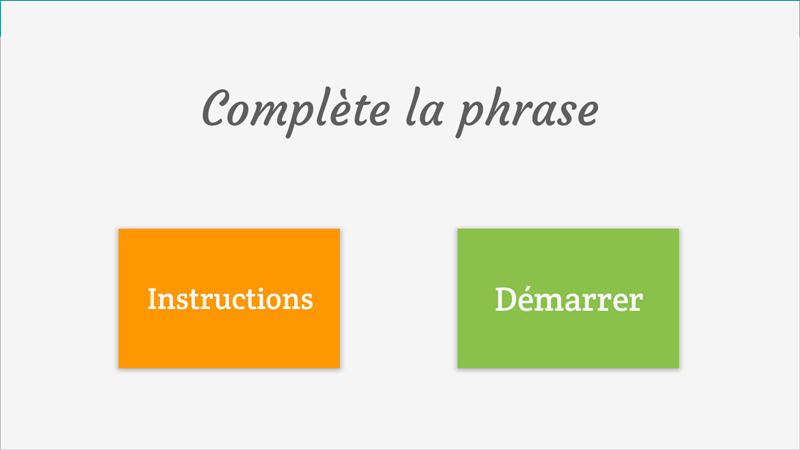 Order the words to create a sentence. 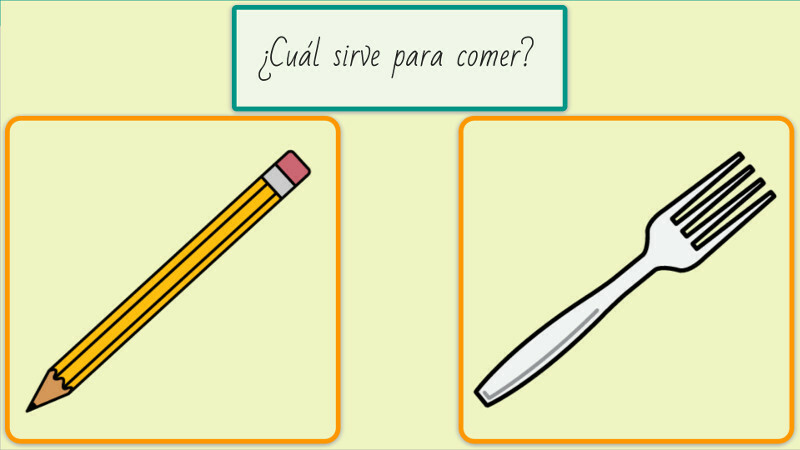 Objectives: identify the words and recognize the logical order to create a meaningful sentence. 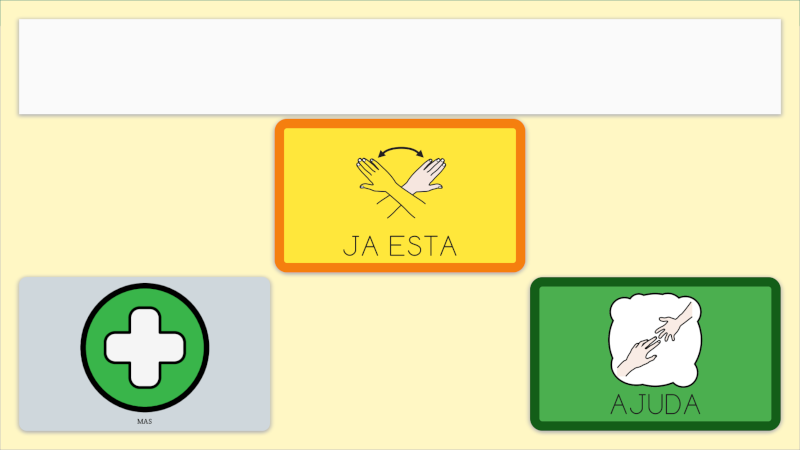 Communication board created for a child of 5 years. 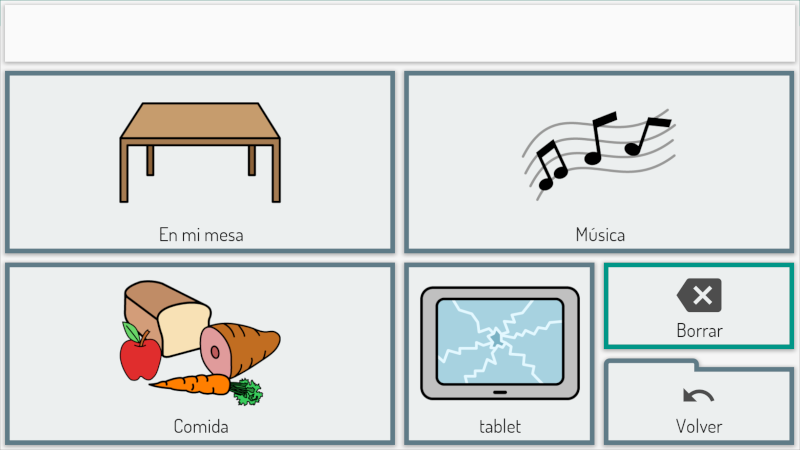 Includes categories of food, clothing, leisure, a keyboard and an activity to play with words. Communication board created for a child of 4 years. Includes categories "I want", "Hello", a game and a video of Youtube. 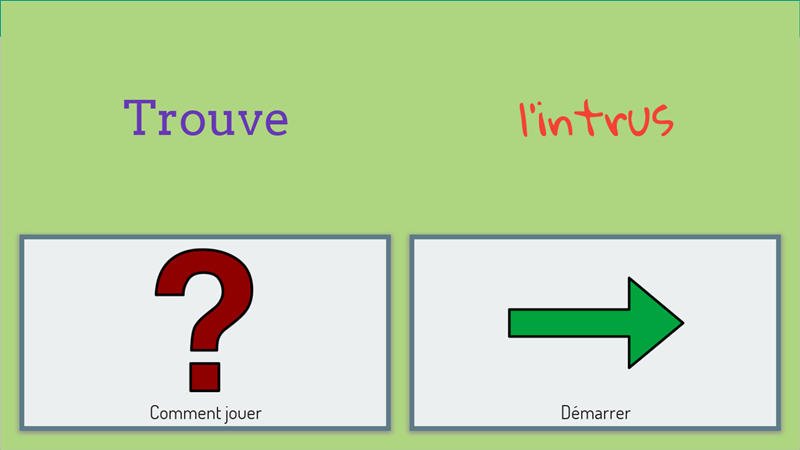 Activity to use with auditory scanning. 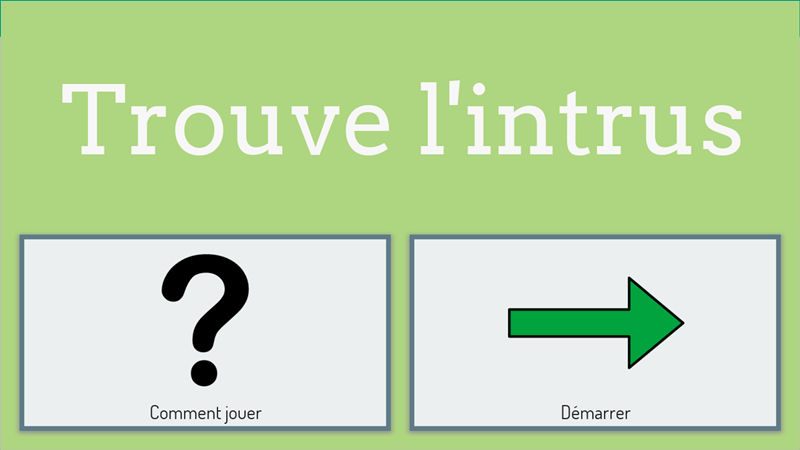 Test your auditory memory and answer the questions. 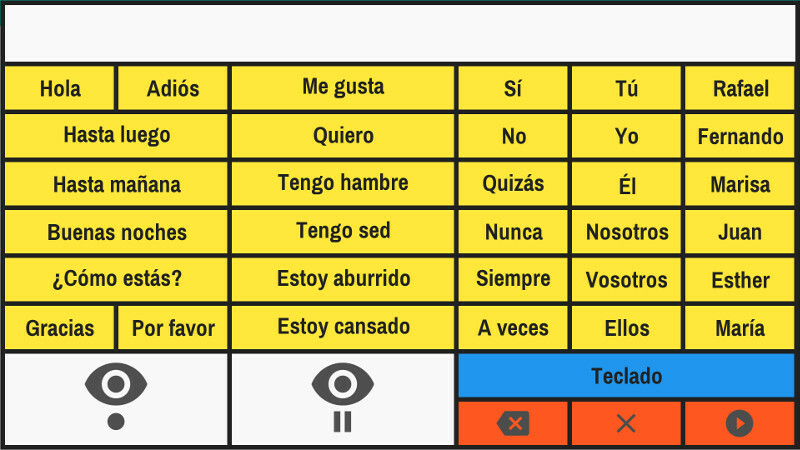 Objectives: improve auditory attention and memory skills. Activity to work on visual attention and the speed of selection. Ideal to start training with switches or eye tracking systems. Click on the same images. Objectives: works in visual attention and image identification. 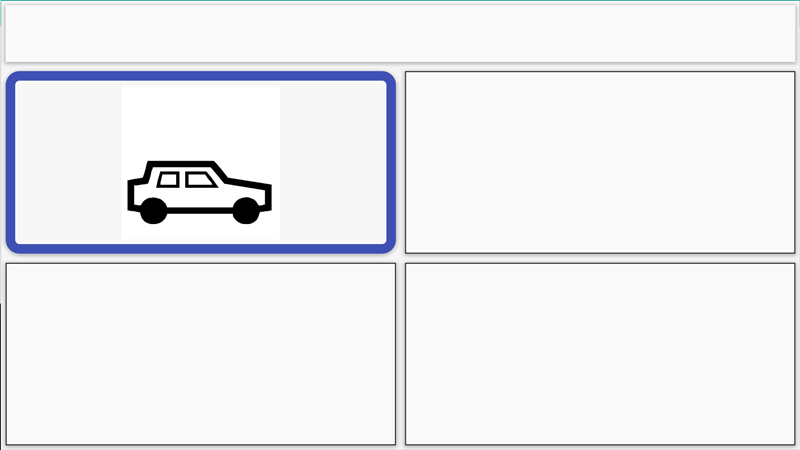 Select the image that is the same as the model. Objectives: work on visual attention and on identification of details. Visual memory game. Wich image has changed? Look at the pictures and remember the details to answer correctly. Objectives: work on visual memory, and improve attention and concentration skills. 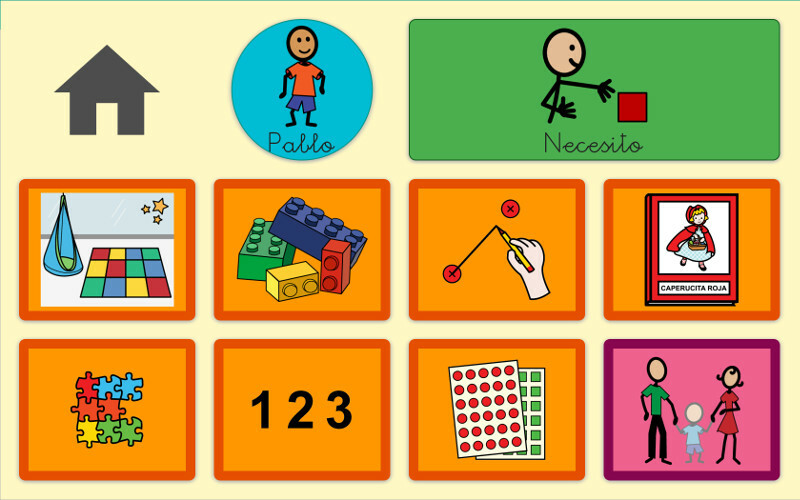 The board is created for a kid with ASD who wants a lot of vocabulary, so we created categories such as playing, greeting, numbers, animals, planets, transports, attributes of people, places, etc. In addition to a "Touch the star" game, according to his taste. Un quaderno di comunicazione per bambini per la scuola e la casa. Combina pittogrammi e immagini reali. 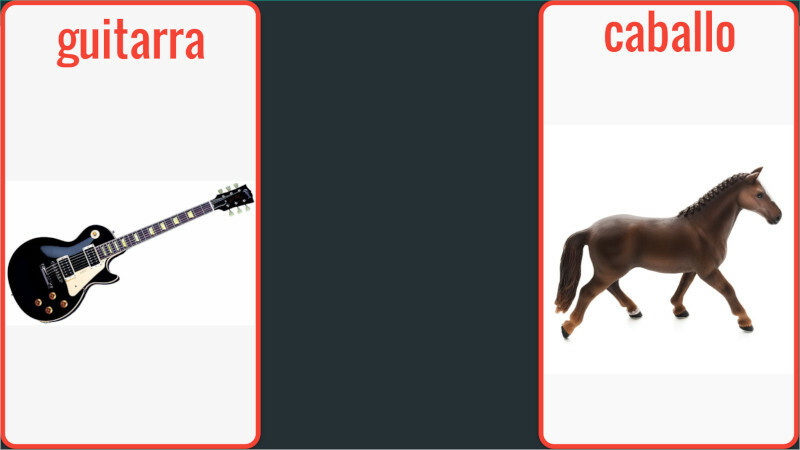 Try to spell the names of these spooky creatures! 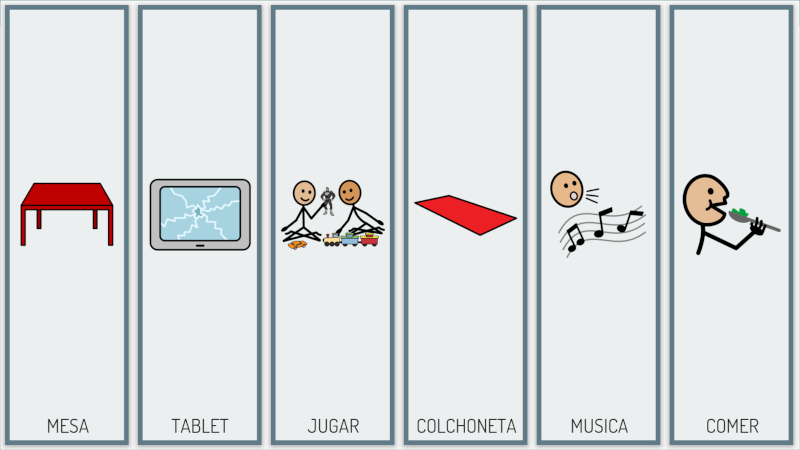 © 2015-2016 Eneso TecnologÃ­a de AdaptaciÃ³n S.L.